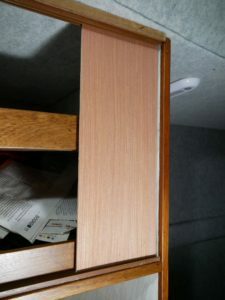 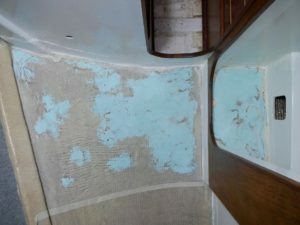 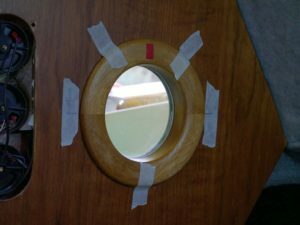 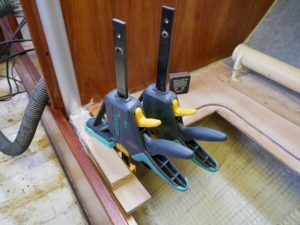 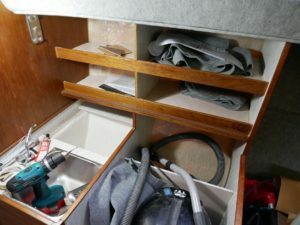 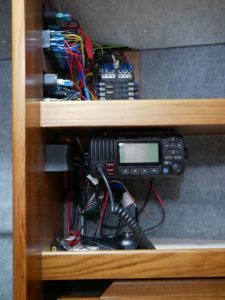 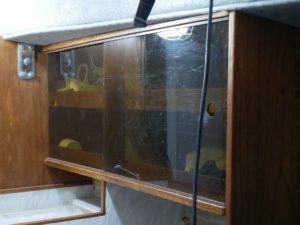 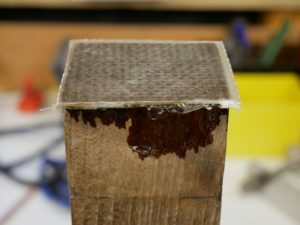 Having found myself frequently referring back to my own blog posts about Fly’s refit and knowing that many friends and fellow boat owners have been following with interest, it’s just occurred to me to create an index of all the refit posts as a useful resource you/we may find doubly useful in conjunction with the blog’s search function. So here it is in ‘interim’ form at least, with thoughts of a ‘final’ version and editing this one to link to that when she goes back in the water in (I’m guessing) May or June this year. 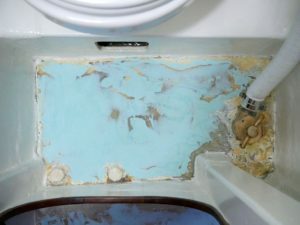 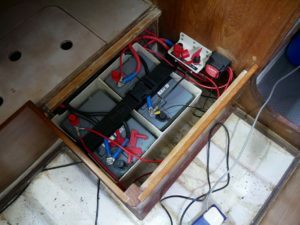 For those unacquainted with the story, it’s been an initially sporadic but latterly concentrated total refit following the 2009 discovery of serious internal water damage while laid up ashore since late 2005, with things both within and without my control to blame for the obvious hiatuses but nothing stopping me now! 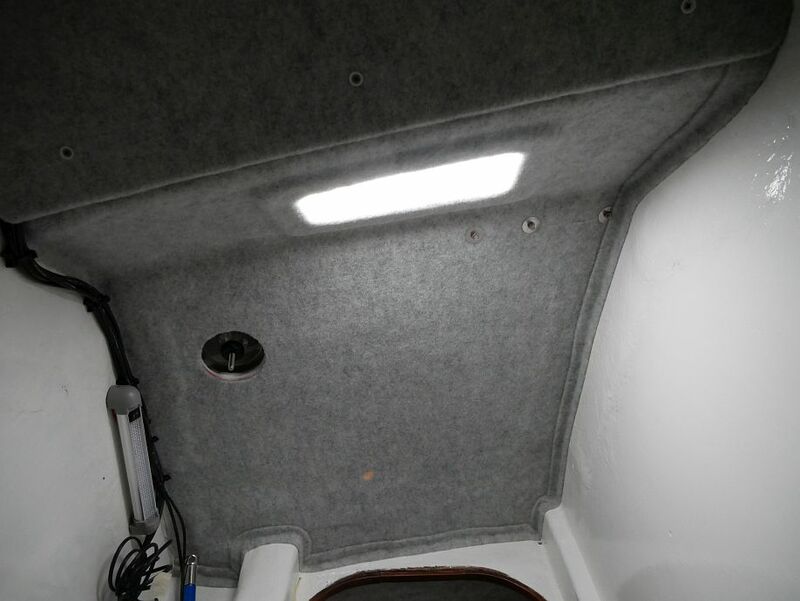 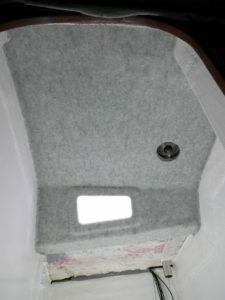 New forehatch in, lots more out. Serious refit starts at last with 100+ hours main cabin paint stripping a year after we finally get the boat dry but my June 2016 shed fire throws a very big spanner in the works. Cutting out the remainder of the main bunk tops. 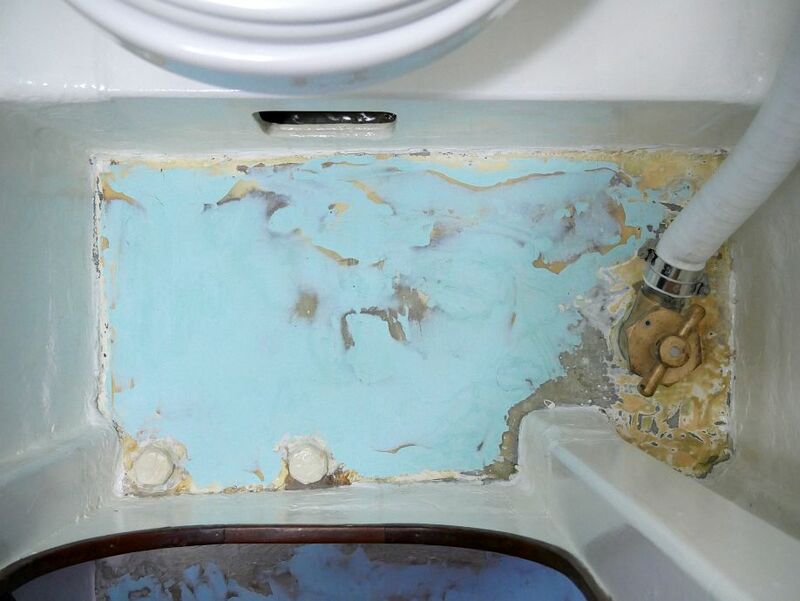 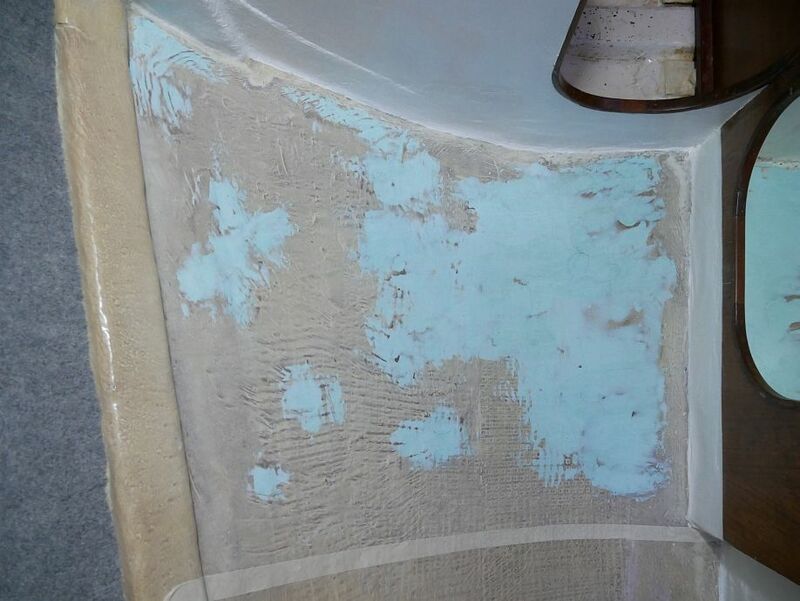 Stripping forecabin paint and testing water tank shapes. 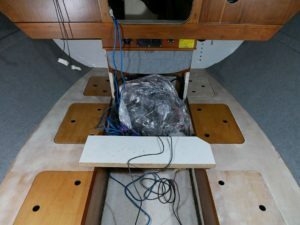 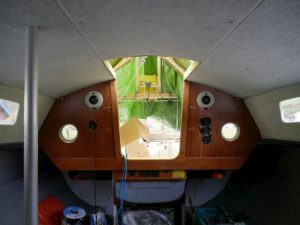 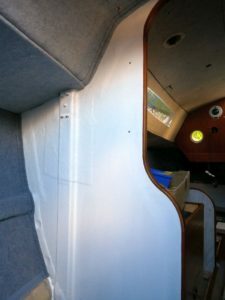 Starting to build an integral water tank, more rotting wood in the cockpit locker false floor and removing the companionway bulkhead facing. 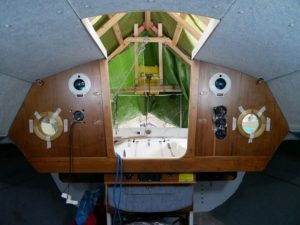 Water tank construction, epoxy coating main cabin hull surfaces and eliminating paths for water ingress to the bow well plywood. Bow well repairs and forecabin epoxy coating. 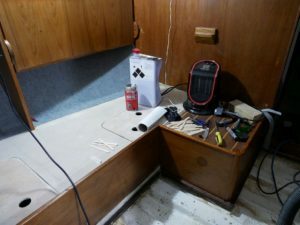 Rebuilding the galley from old and new parts. 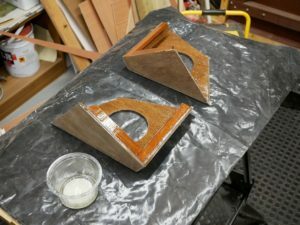 More paint/varnish stripping and priming. 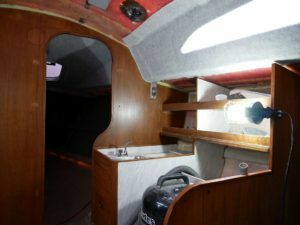 Varnishing, undercoating, new nav. 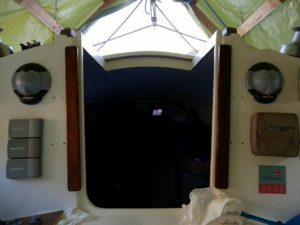 station bulkhead and planning an integral cool box. More nav. station (including testing chart table fit), galley and varnishing. 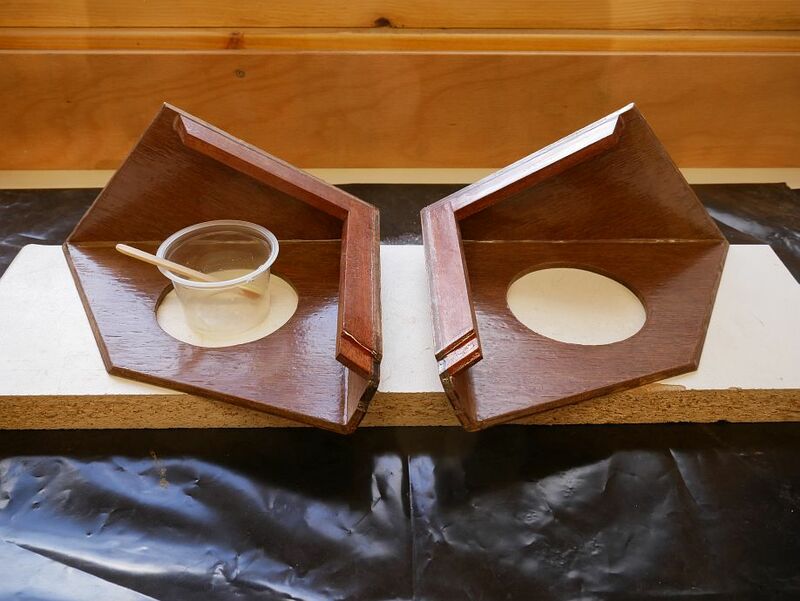 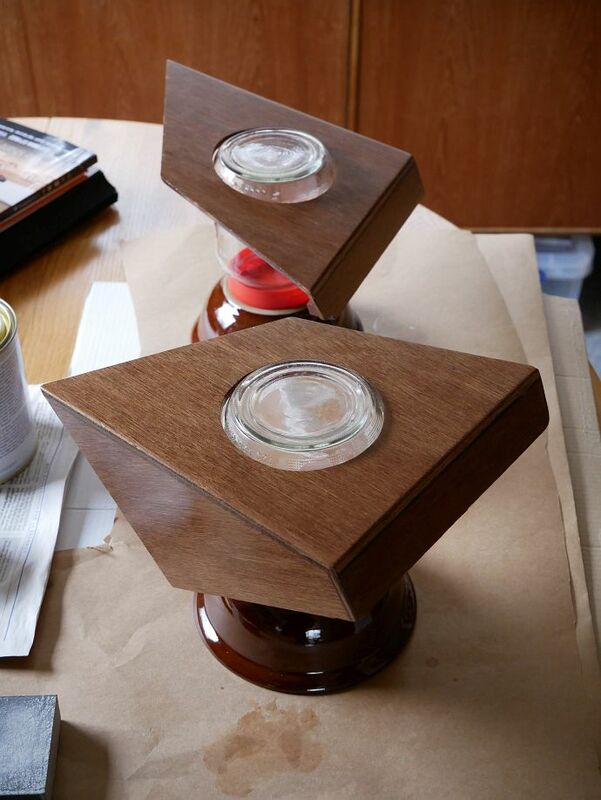 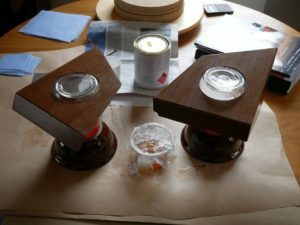 More painting and varnishing including the (awkward!) 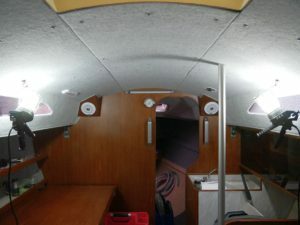 heads compartment. 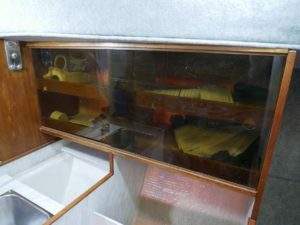 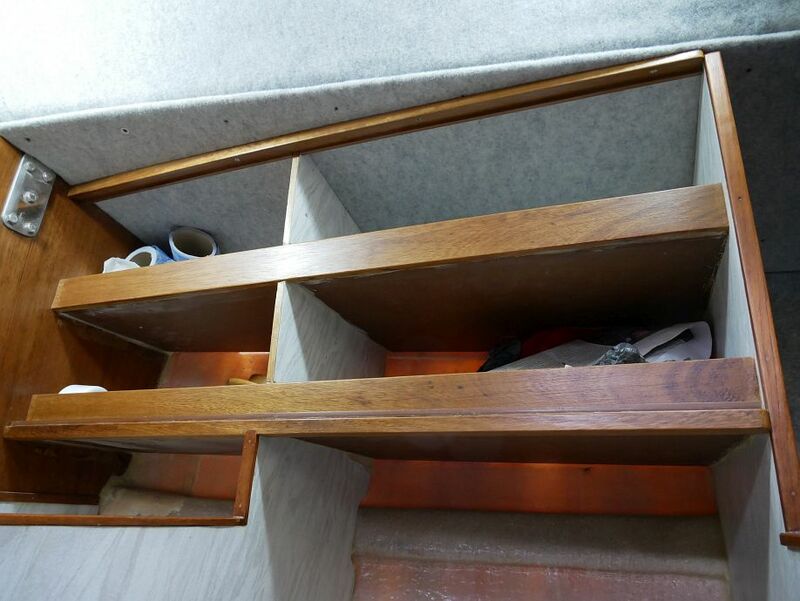 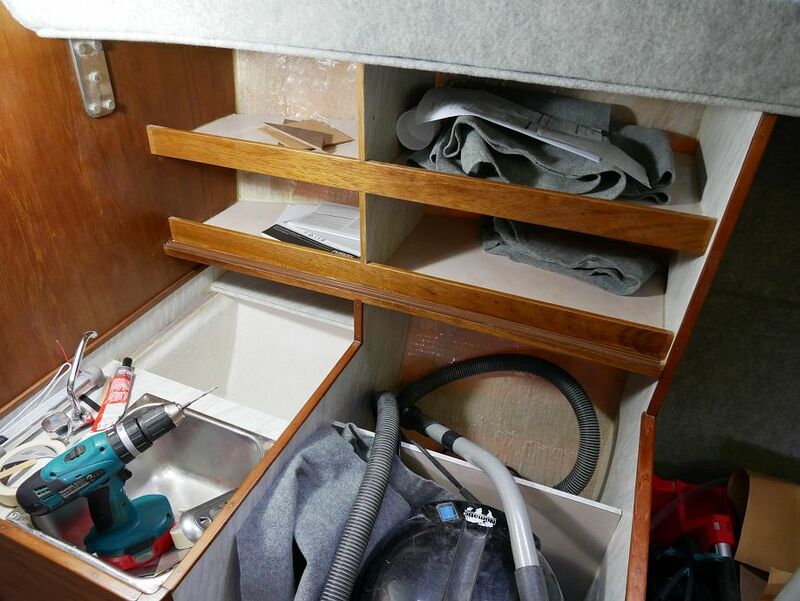 Stripping bunk-foot lockers for repainting and remaining galley paint/varnish stripping. 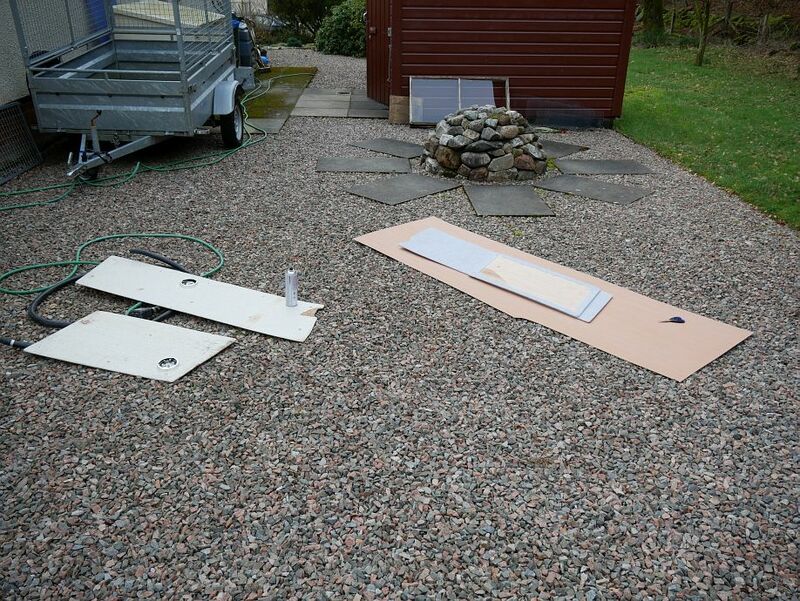 Preparing and painting more awkward woodwork. 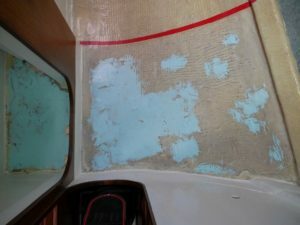 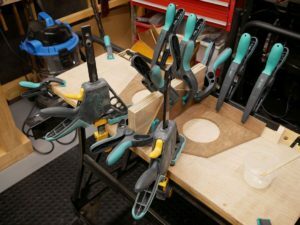 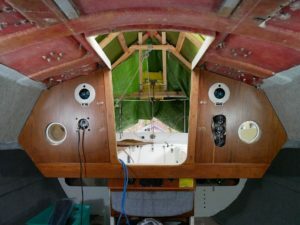 ‘one week and approximately 41 hours of work’ stripping the cockpit lockers. 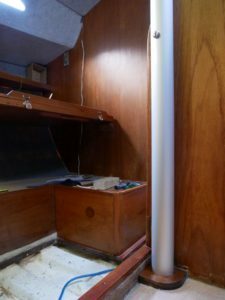 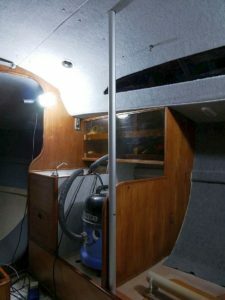 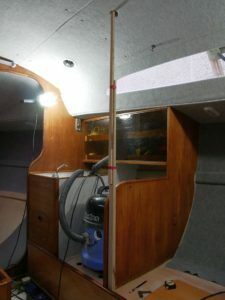 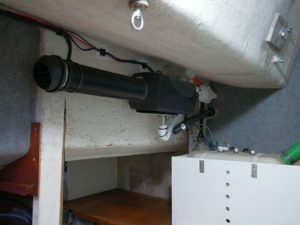 Mast step rebuild, galley, water tank and seacock renovation. 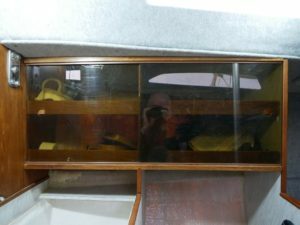 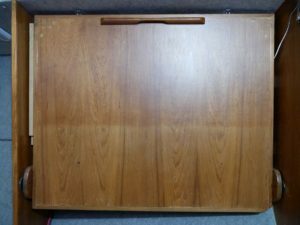 Quick summary of stuff you can’t see, with a few pics of stuff you can! 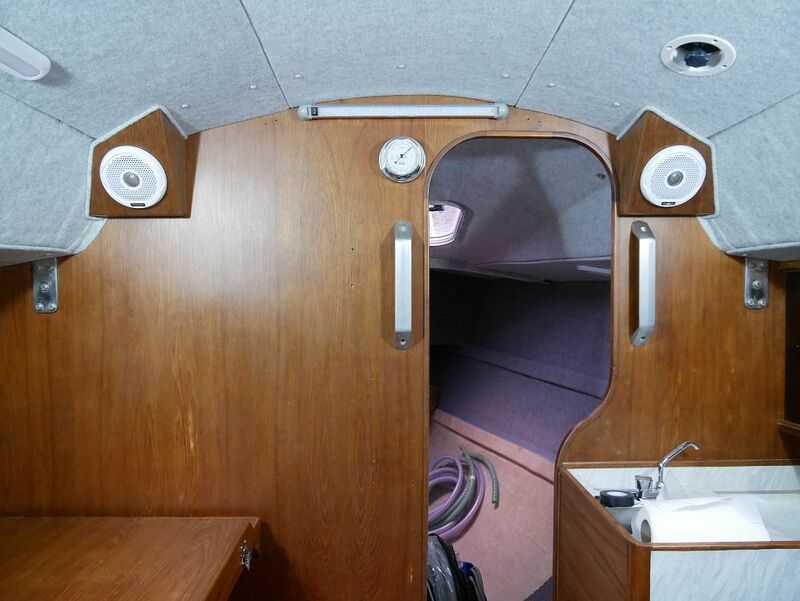 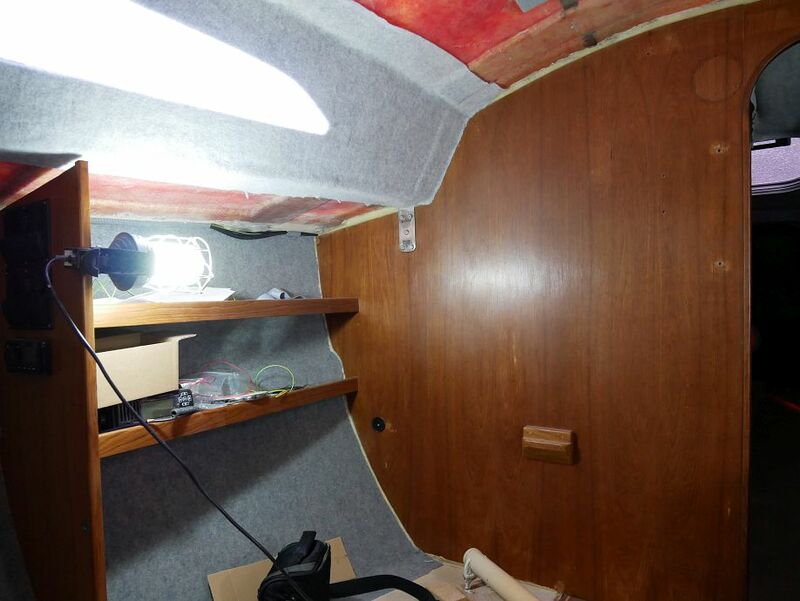 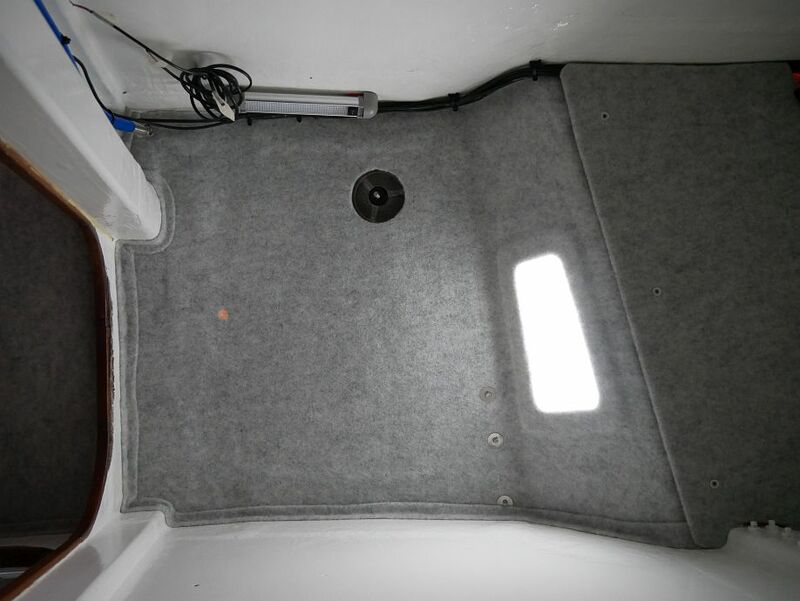 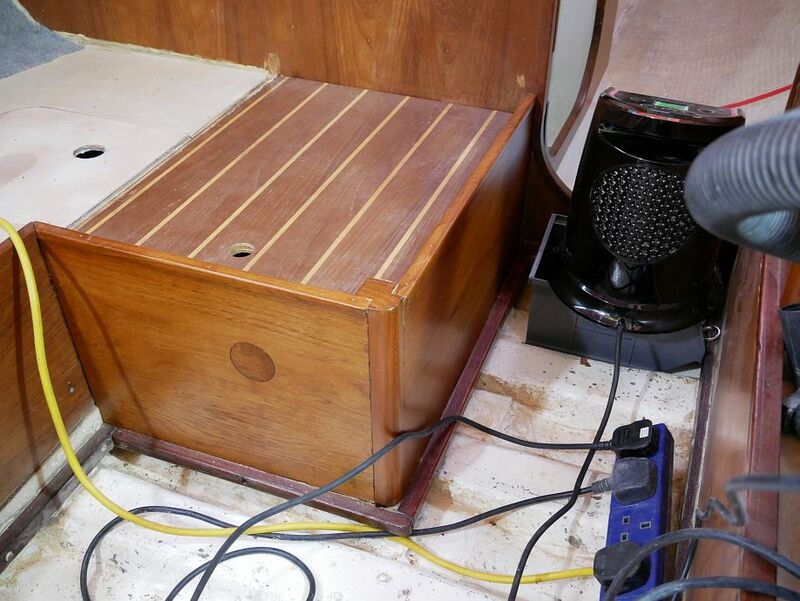 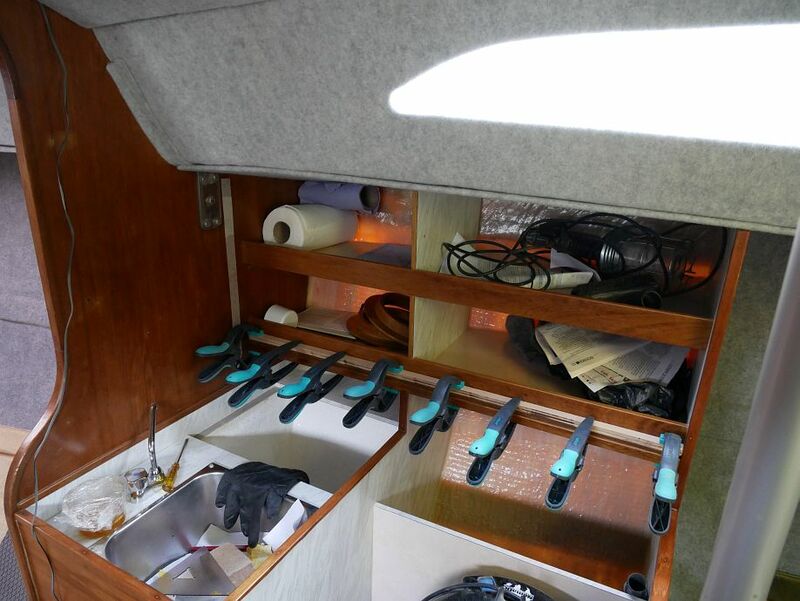 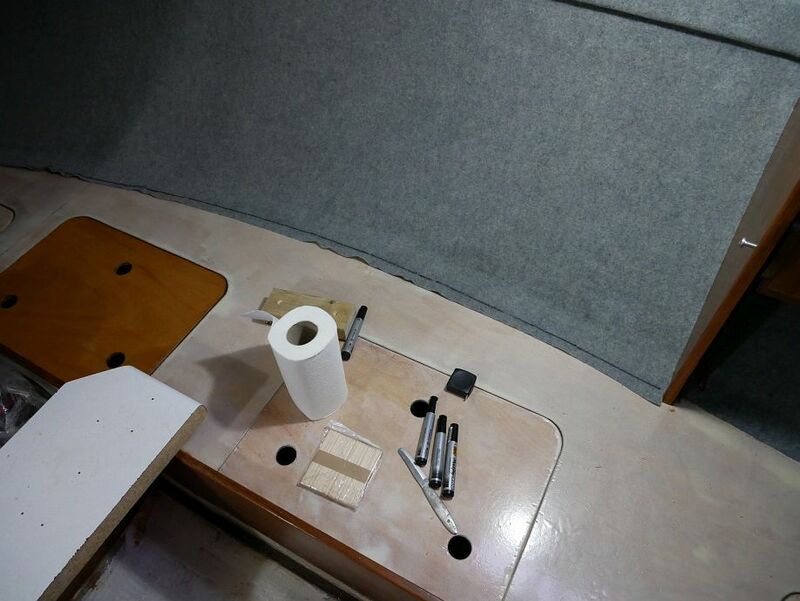 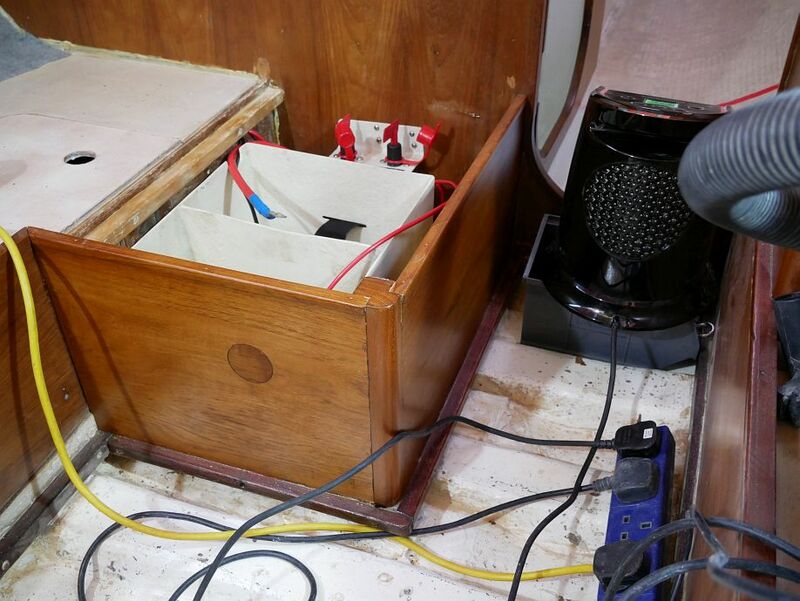 New (Jabsco) marine toilet, water pump, filler, chart table support block, switch panels, wiring, heads window and teak rings for heads door handle, as well as chart table progress, starting internal hull lining and cleaning the engine bay. 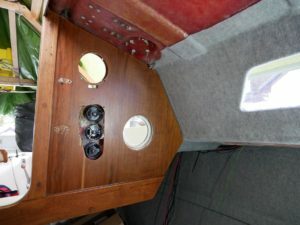 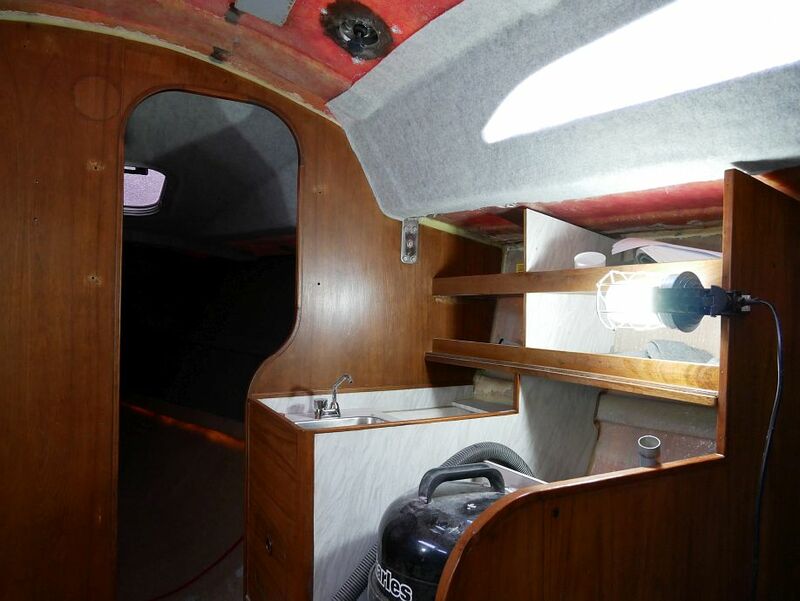 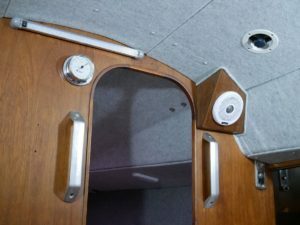 Engine back in, new Vetus mushroom vents, painting (priming) the areas of deckhead where light would otherwise bleed through lining carpet, new stereo, planning custom speaker enclosures, battery box restoration and cleaning/recoating exposed areas of keelbolts and plates. 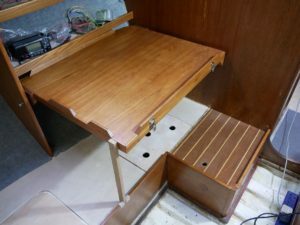 Battery box back in, minor tiller repair, chart table body and lid back together, and preparing for new Treadmaster in forecabin and heads. 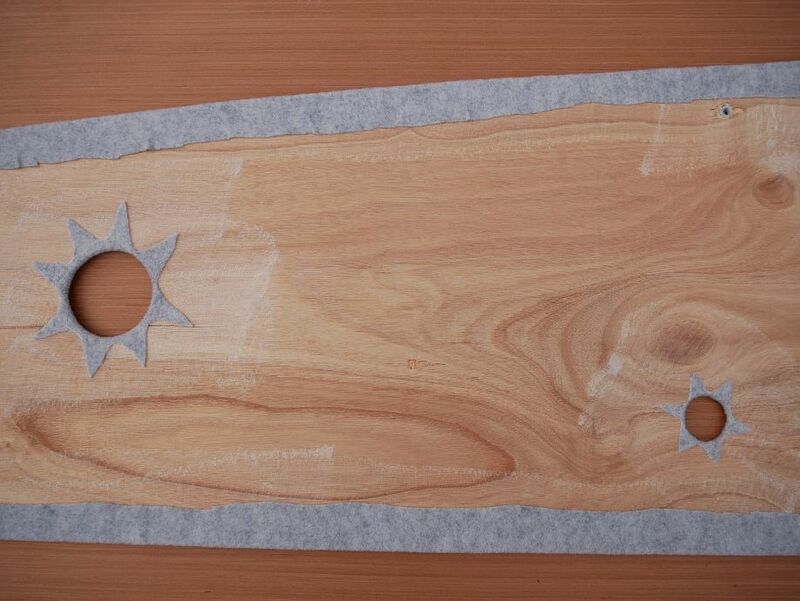 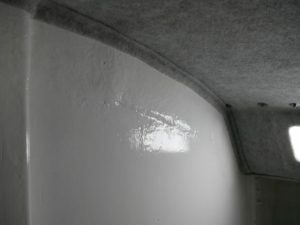 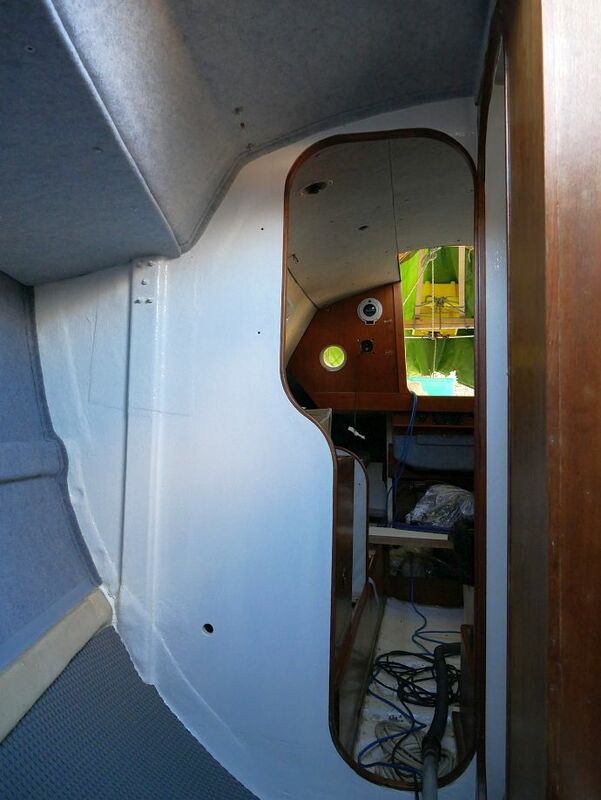 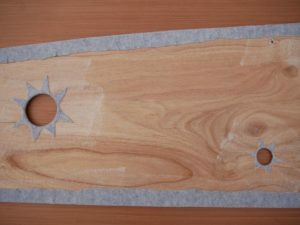 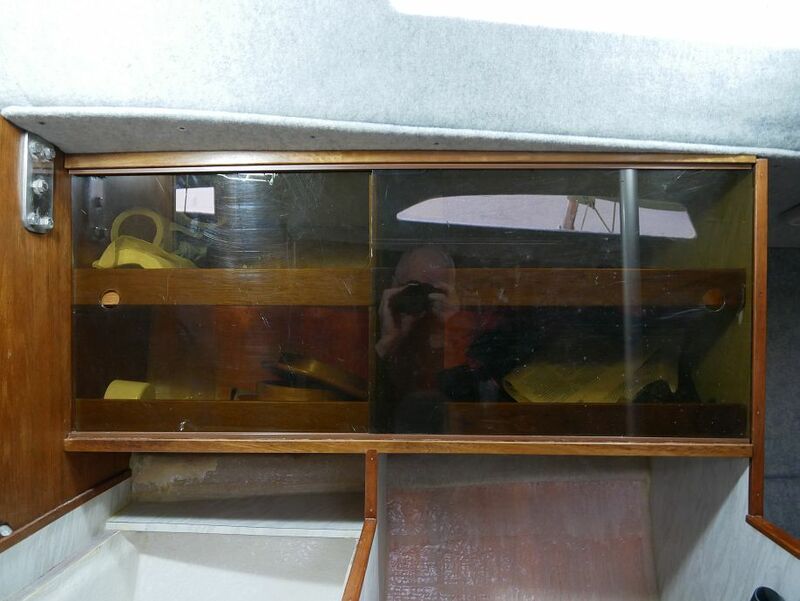 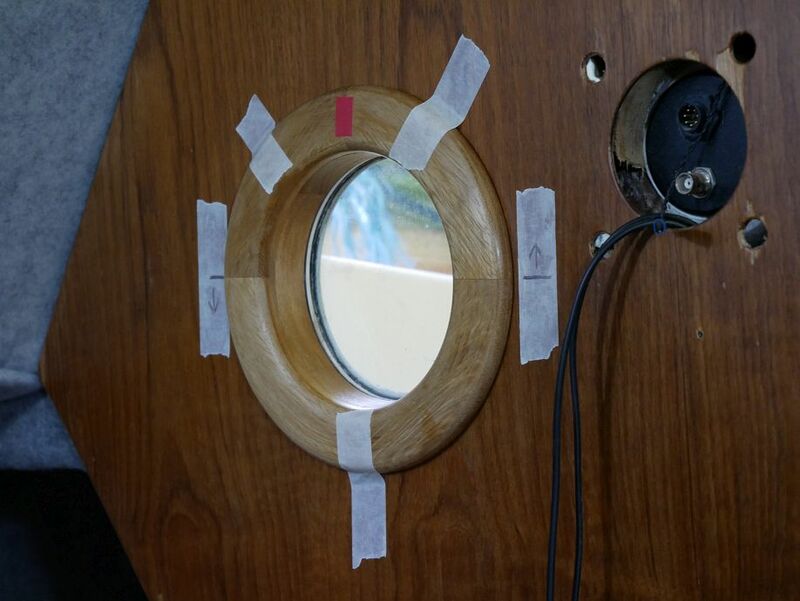 Heads and forecabin linings, and companionway bulkhead facing back in. 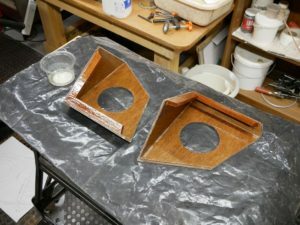 Prototype speaker enclosures and other bits and pieces. 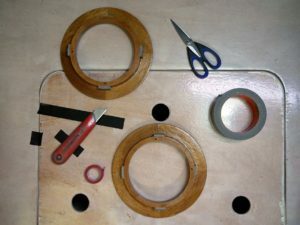 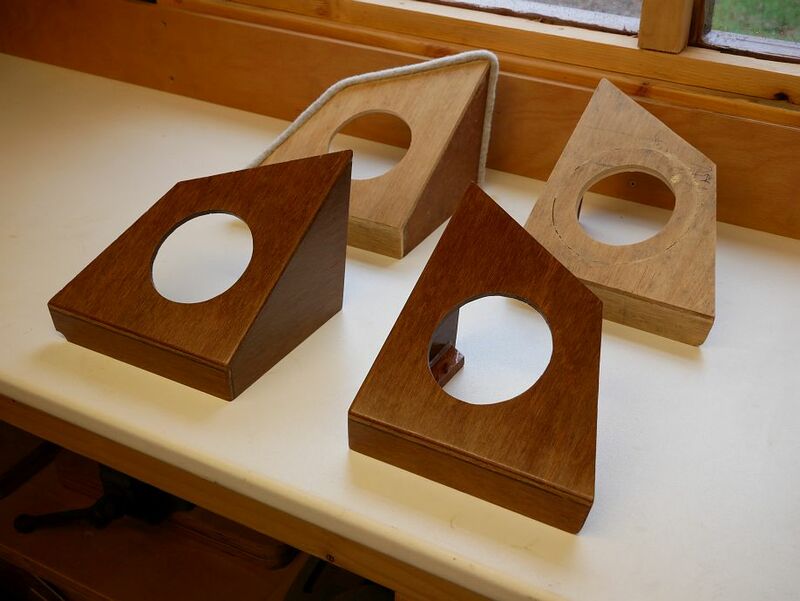 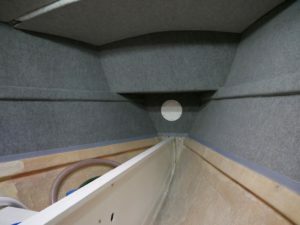 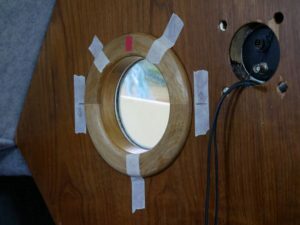 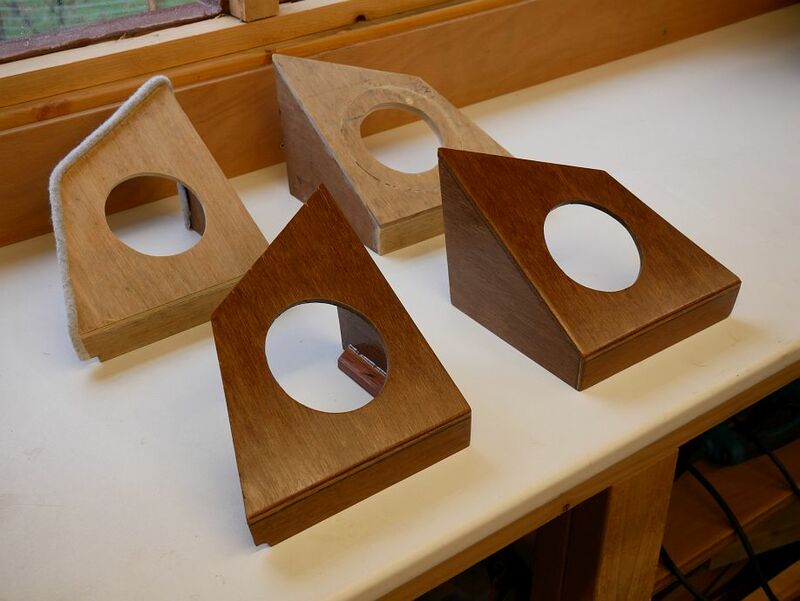 Headlining panels, new spacer disks for pilot berth hanger eyes, porthole liners for companionway bulkhead and building the final speaker enclosures. 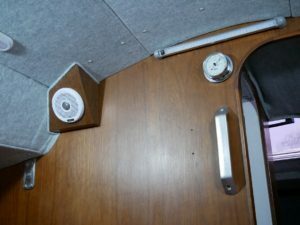 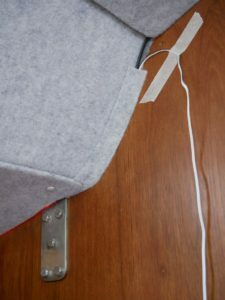 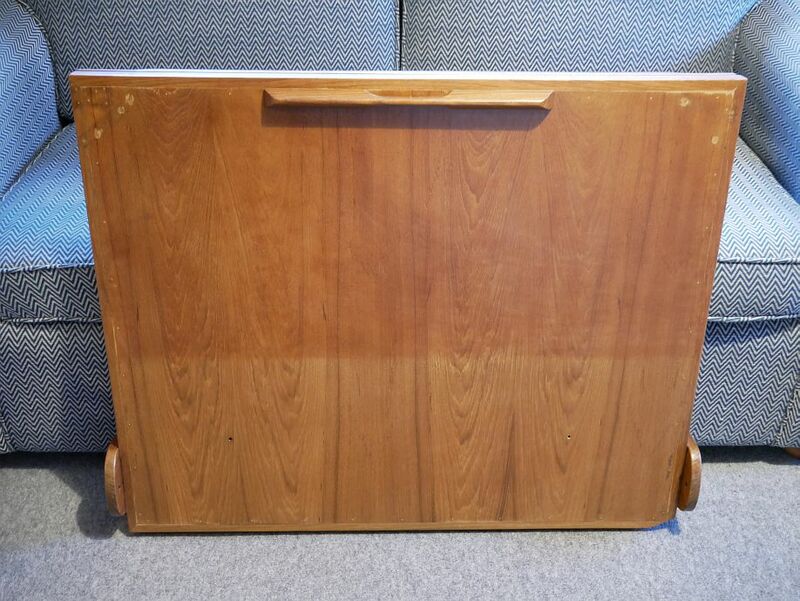 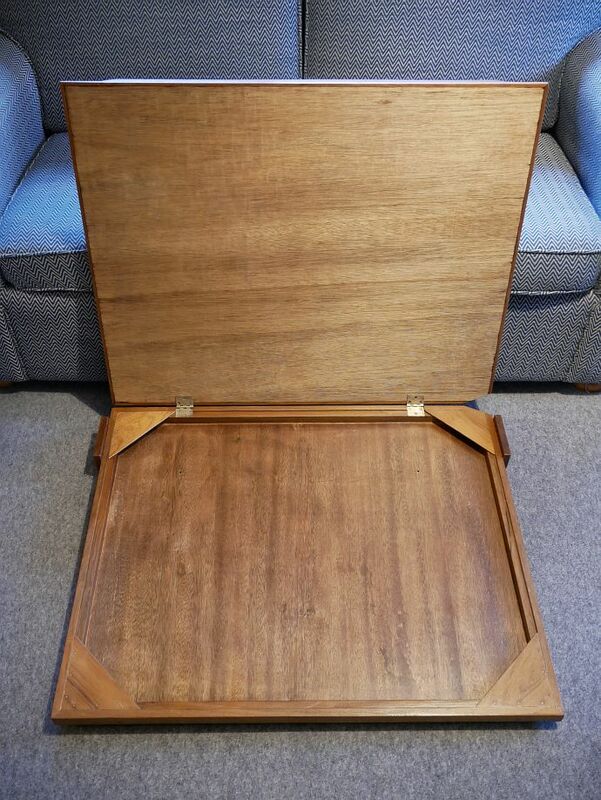 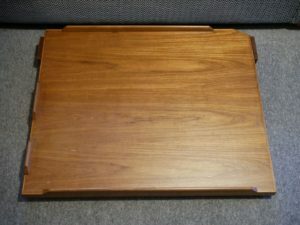 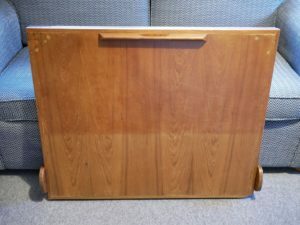 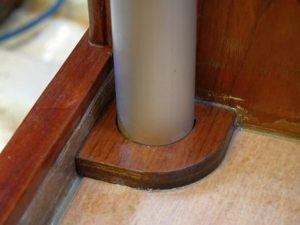 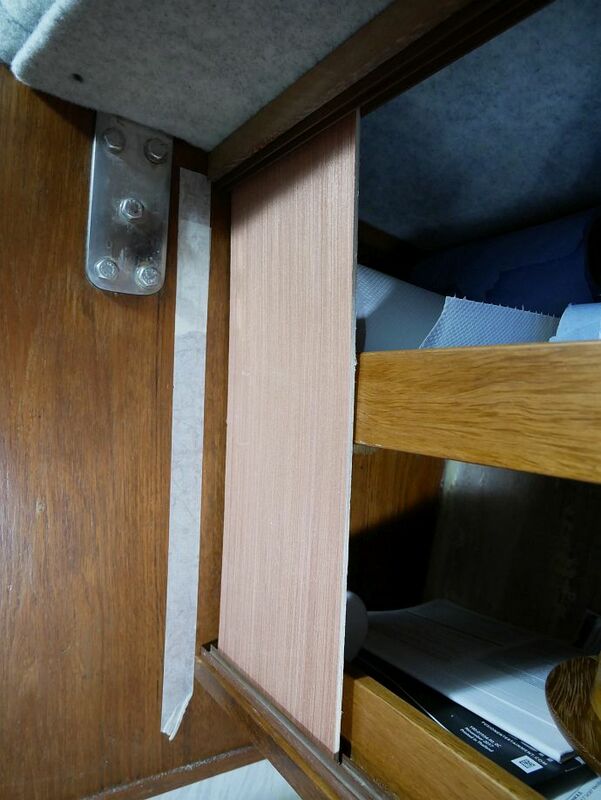 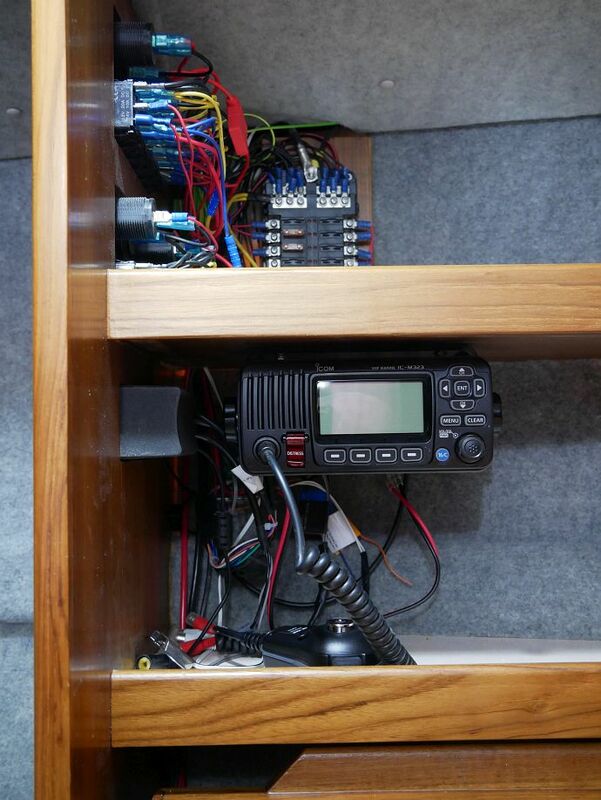 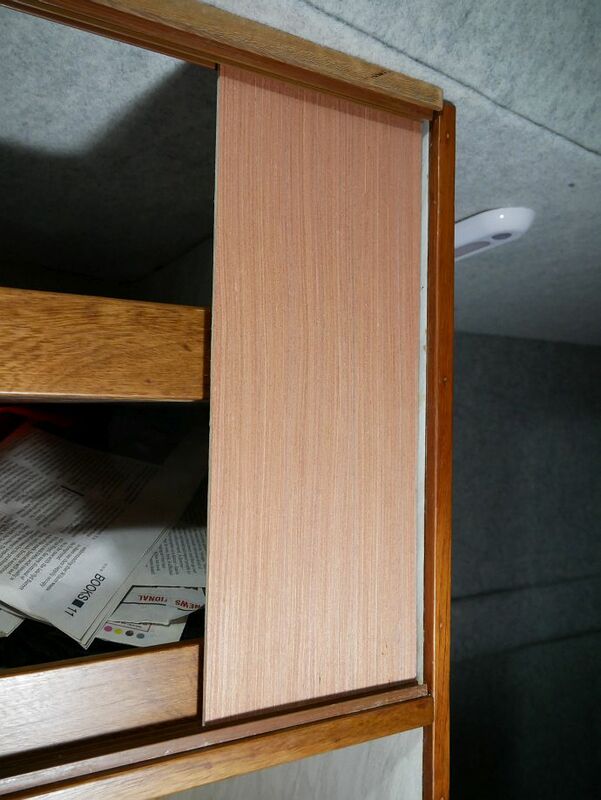 New mount for top galley door track, chart table leg and trim for speaker enclosures. 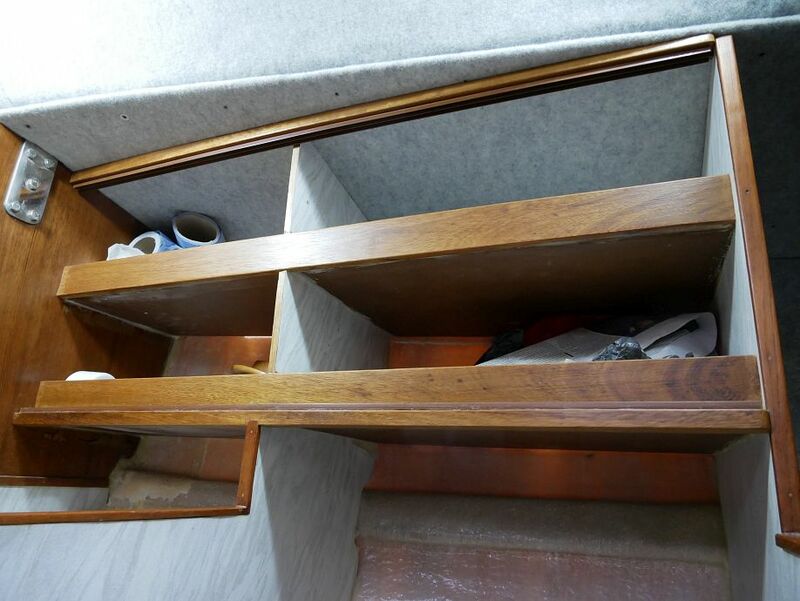 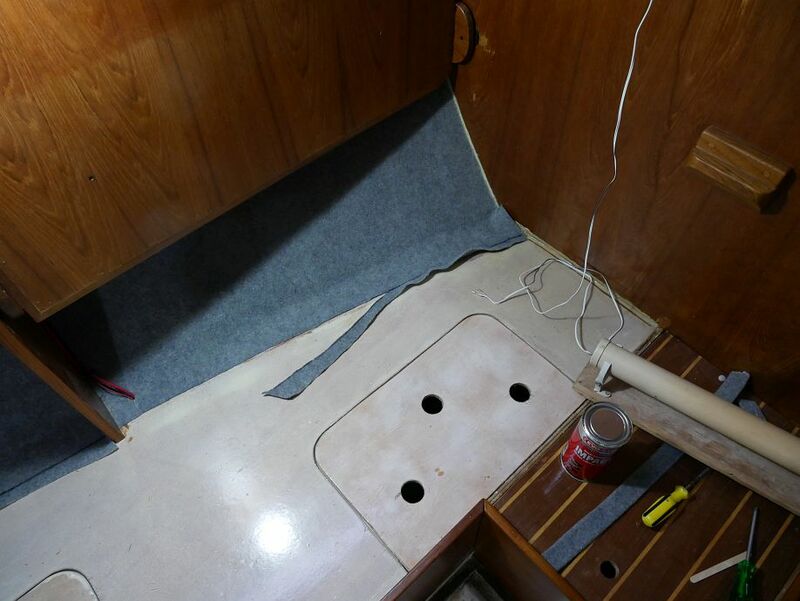 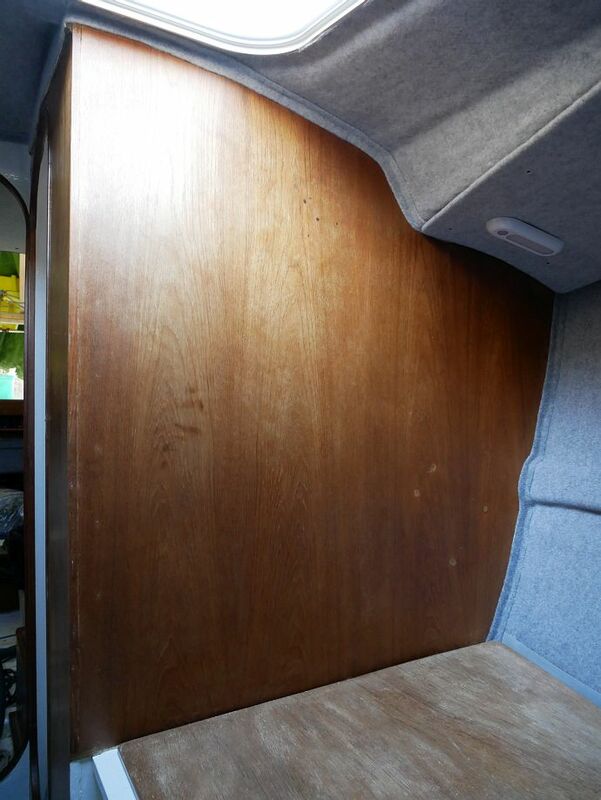 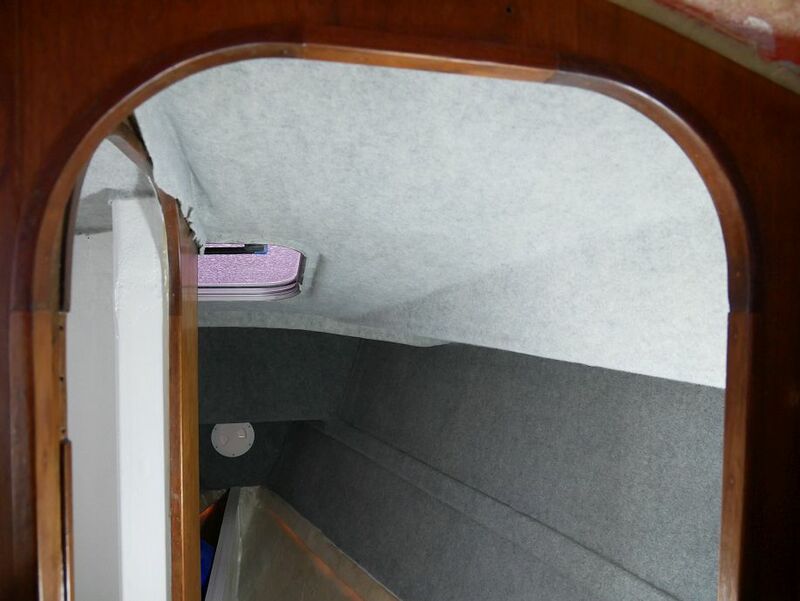 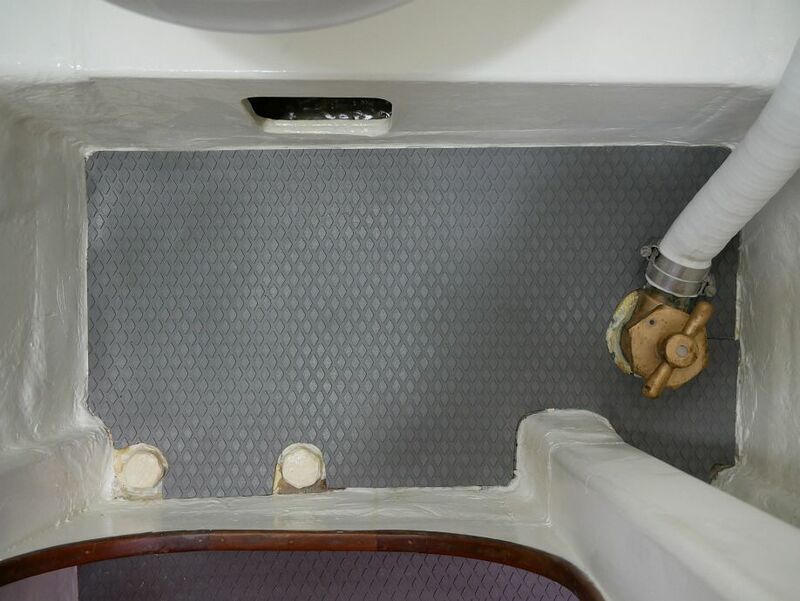 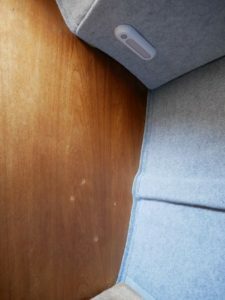 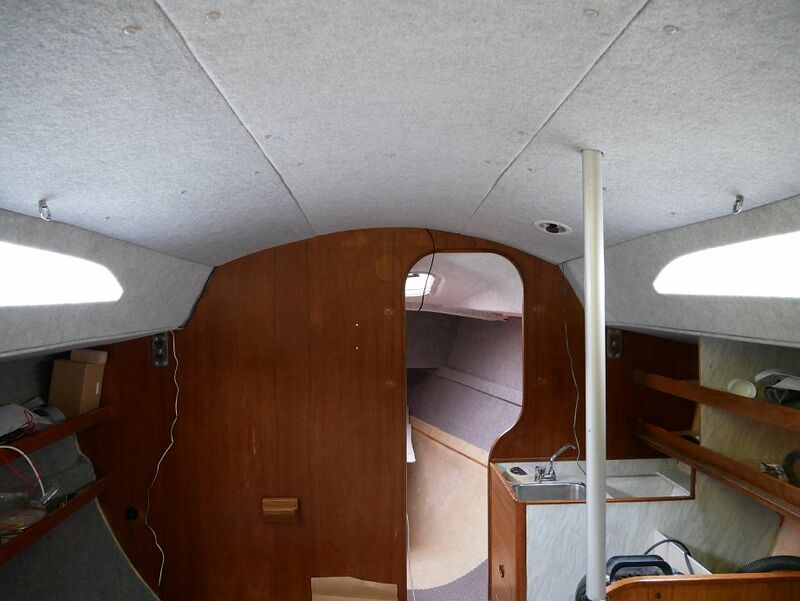 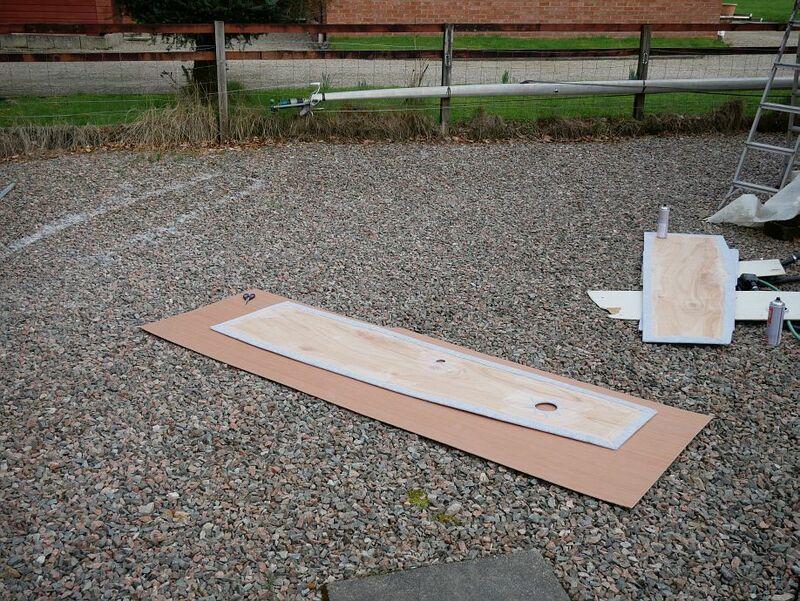 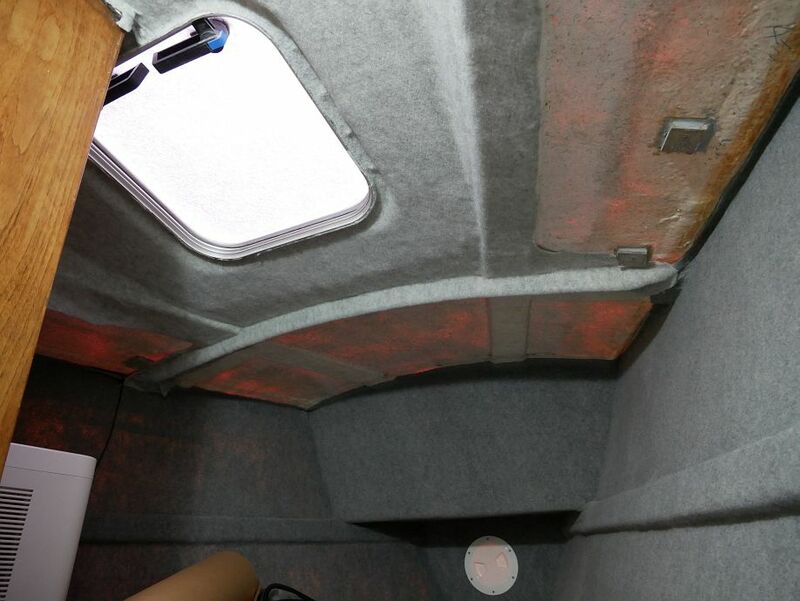 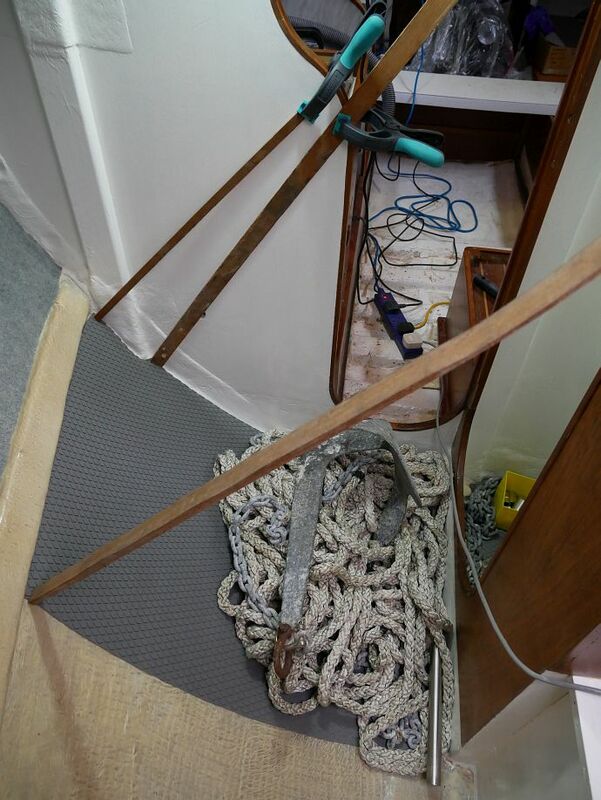 Refitting the galley doors and starting to tidy awkward edges of lining carpet. 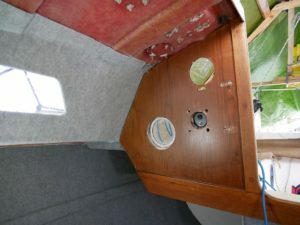 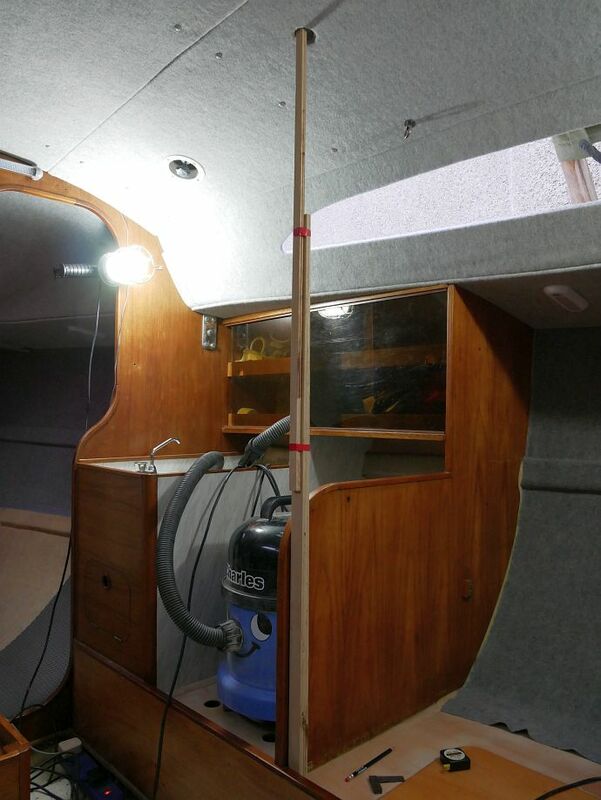 Refitting the galley pole, lots more carpet trim and cleaning/oiling the washboard rails. 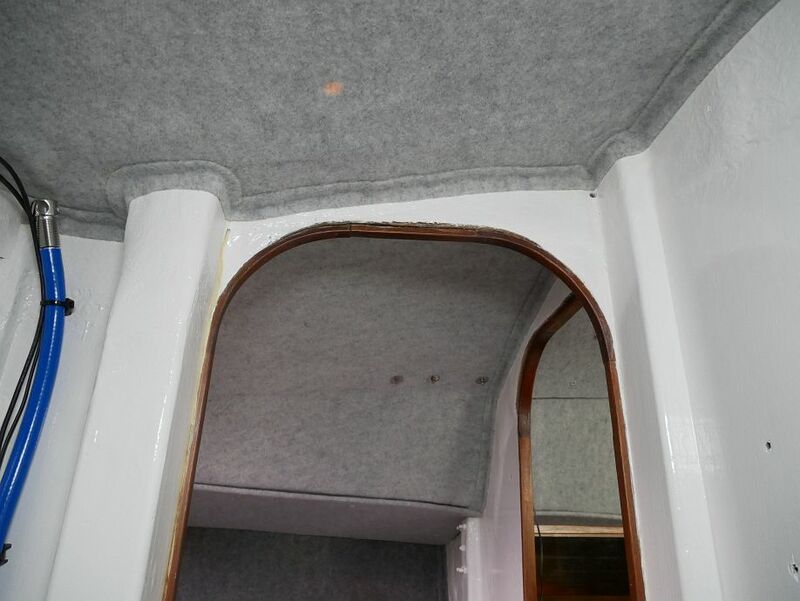 Another completed epoxy job you can’t see here except in passing (last two photos above) because I’ve not specifically photographed it was stripping and coating the backs of the bunk fiddles, which had been on my to-do list for a long time but finally got done because it had to be prior to affixing these new blocks. 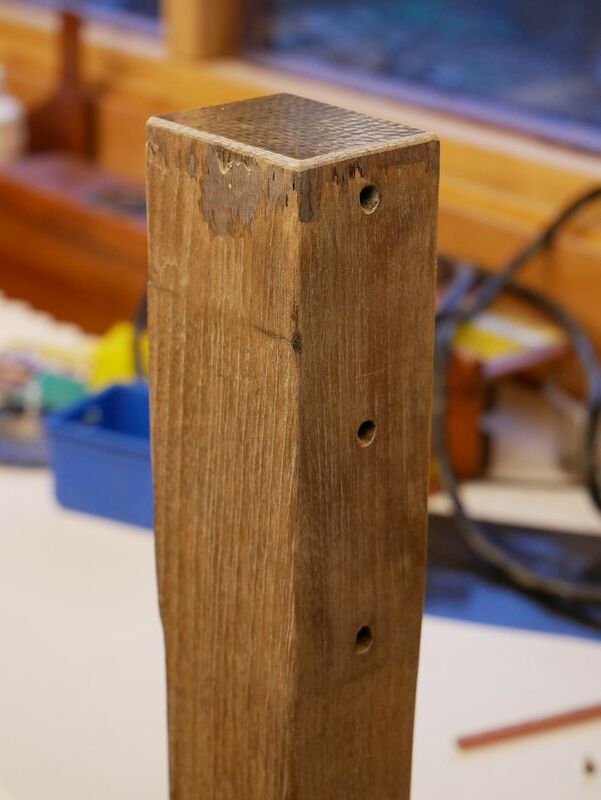 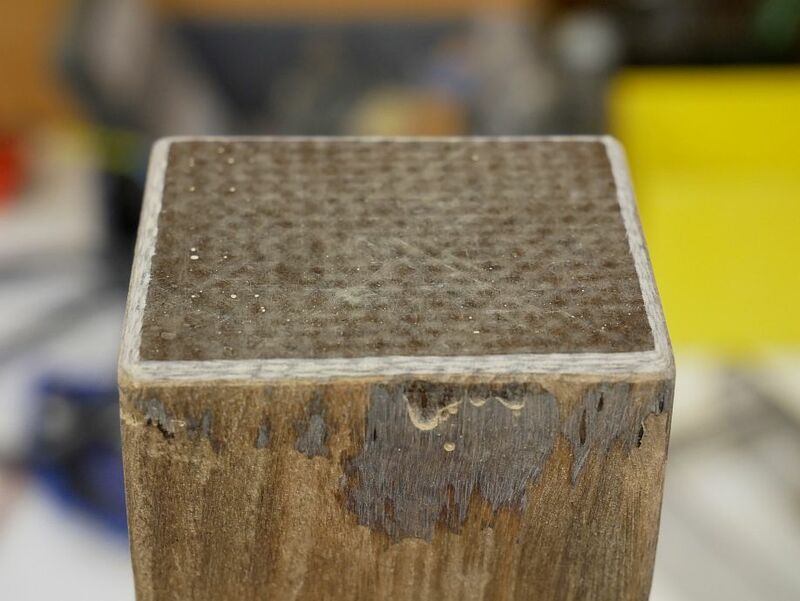 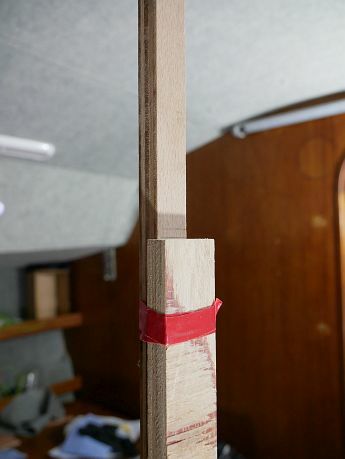 But I’ve not glued the socket for the chart table leg yet because we’ve still to fit the correct spacers either side of the table before I can mark its precise fore-and-aft position. 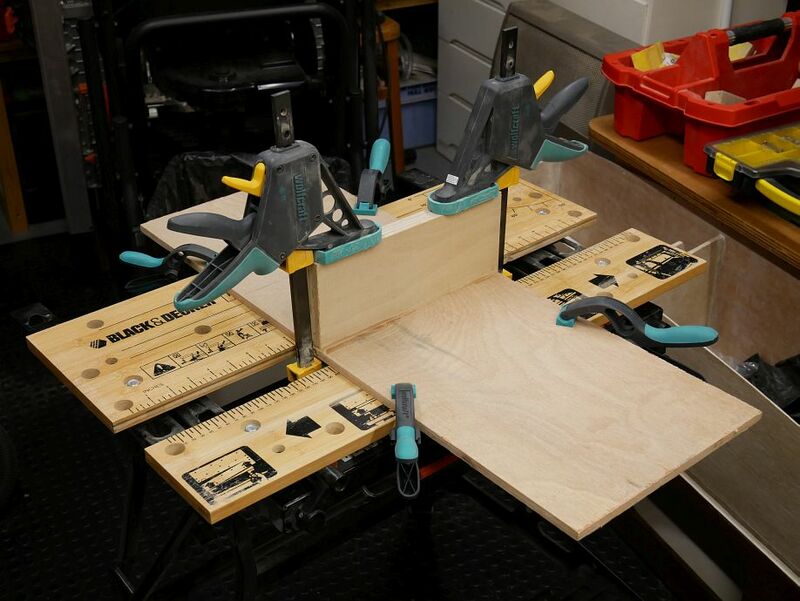 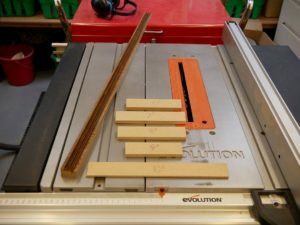 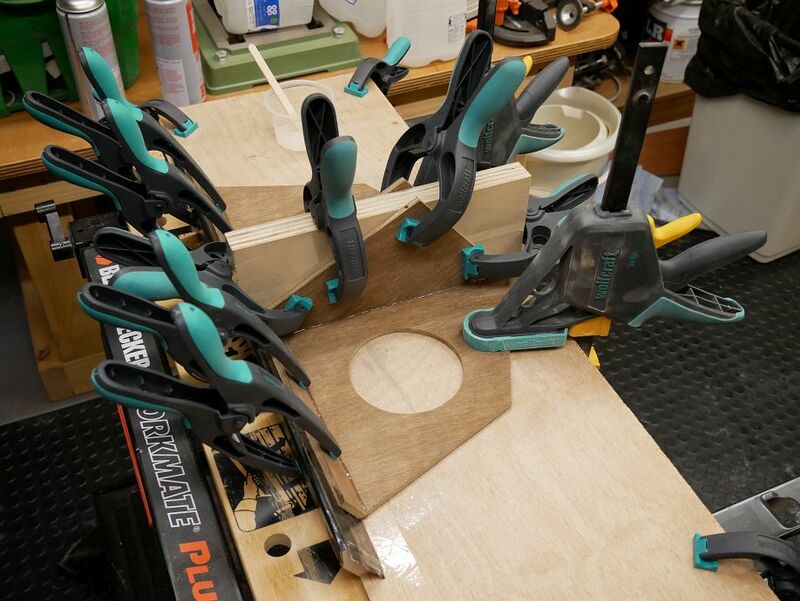 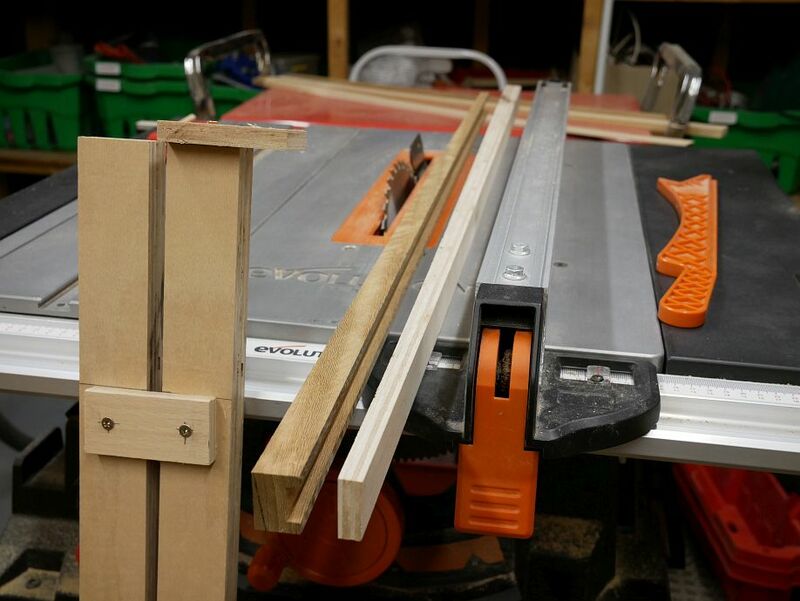 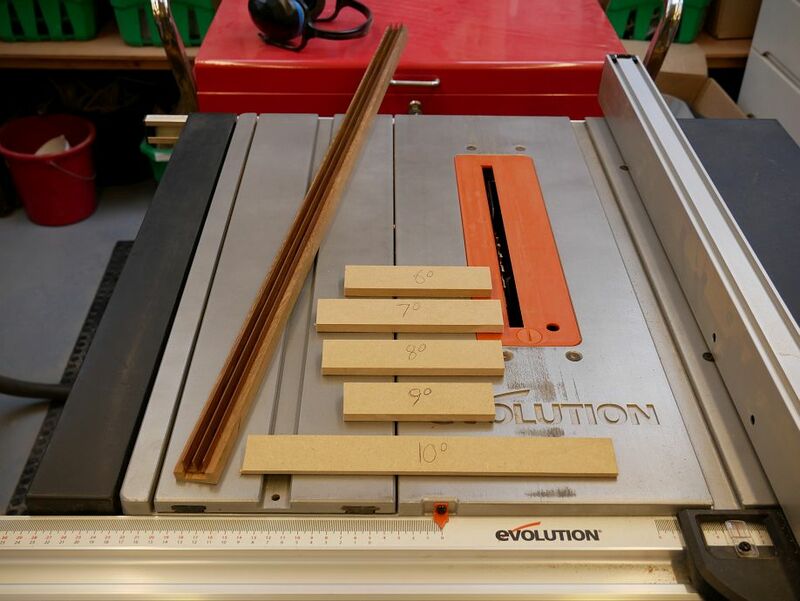 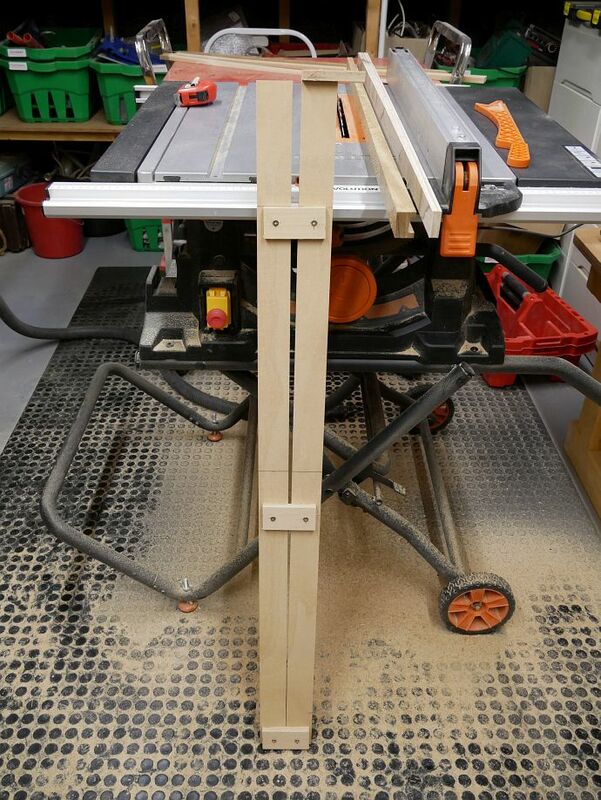 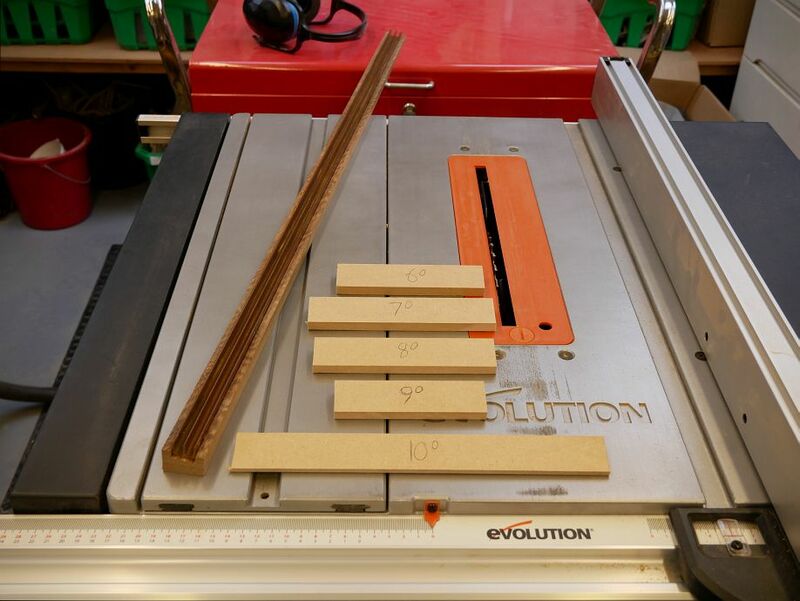 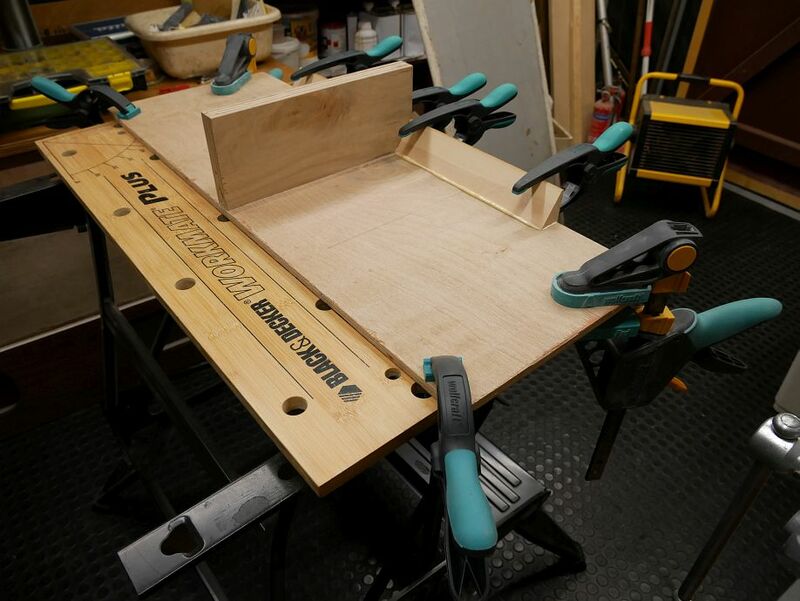 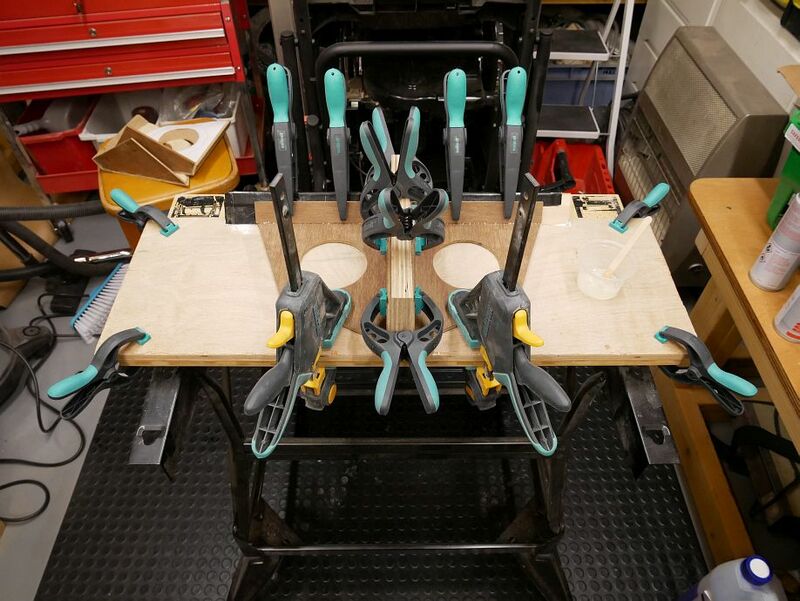 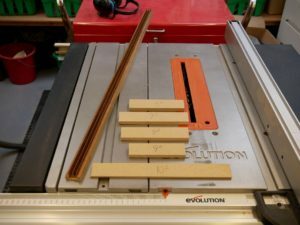 What length should it be to keep the table true when you’re working with one corner unsupported? 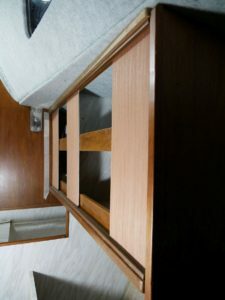 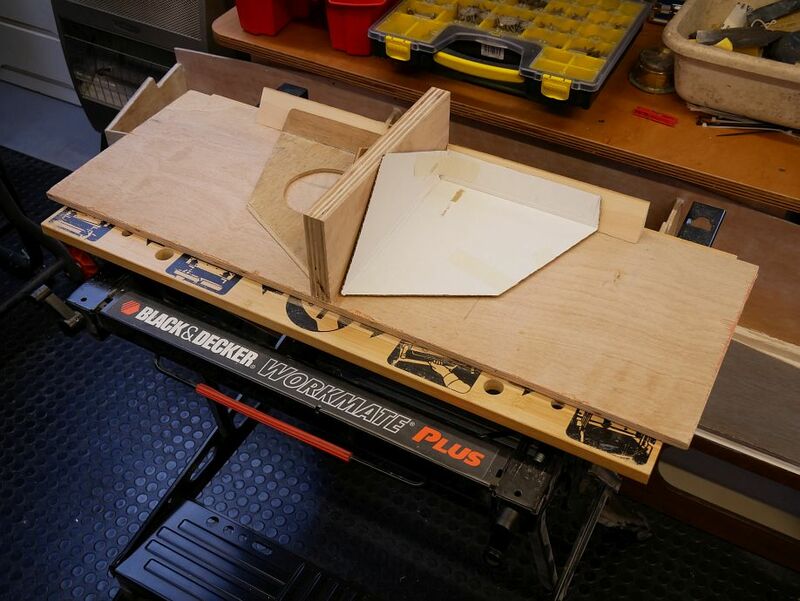 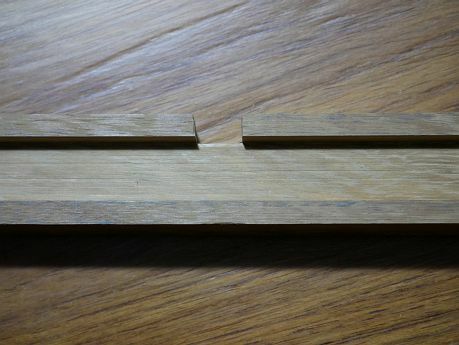 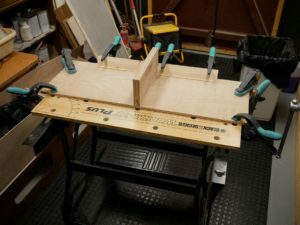 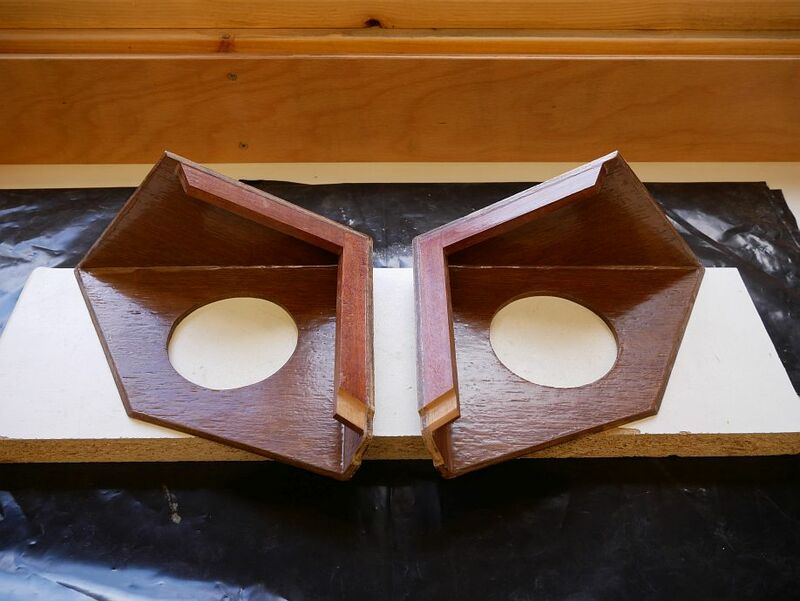 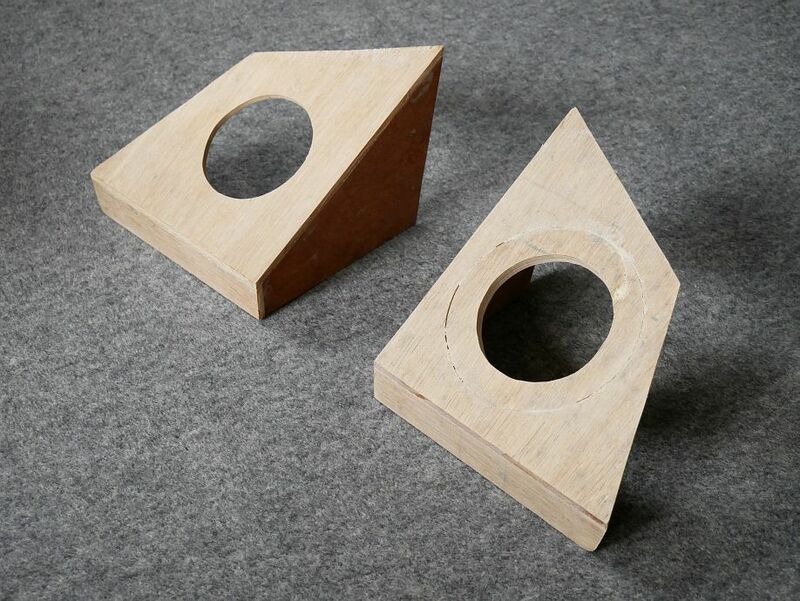 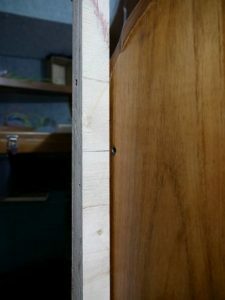 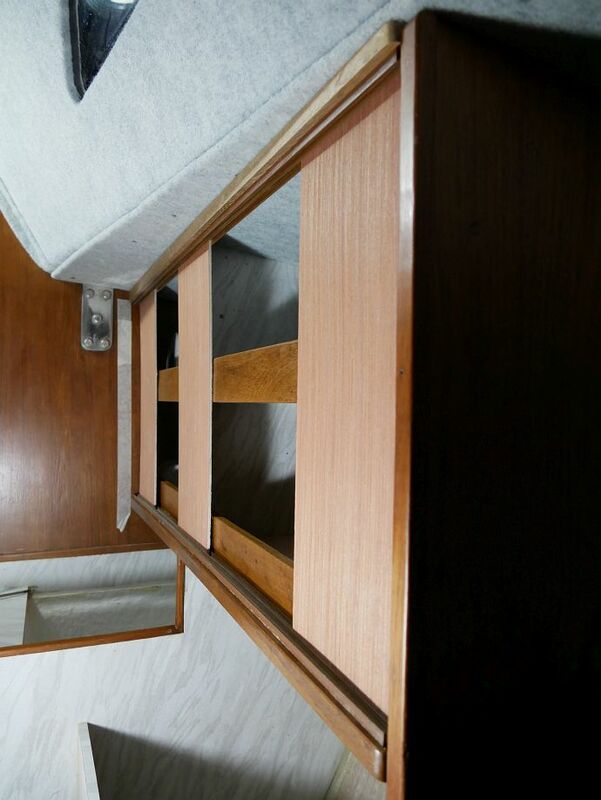 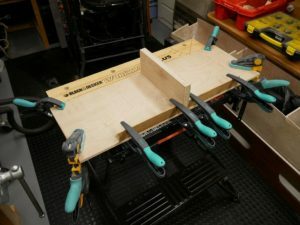 Where should it meet the bunk top fore and aft and where should it be attached to the table to keep it vertical in both planes? 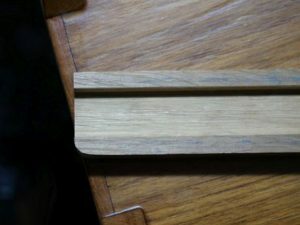 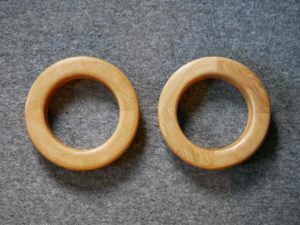 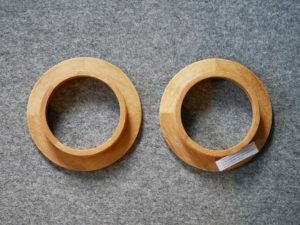 Is it going to be strong enough (fit for purpose) both in itself and how it’s attached? Will it fold up neatly out of the way? 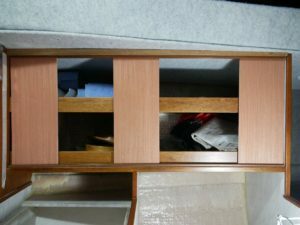 What happens if someone knocks it from an unexpected direction? 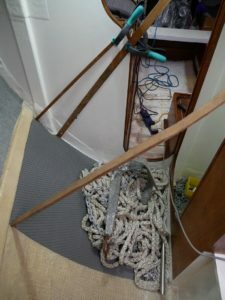 How do you hold all of this where you want it to jig it up for drilling? 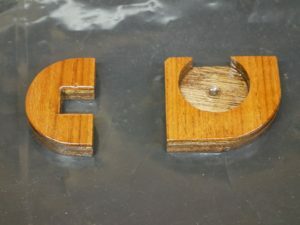 And did you get it right? 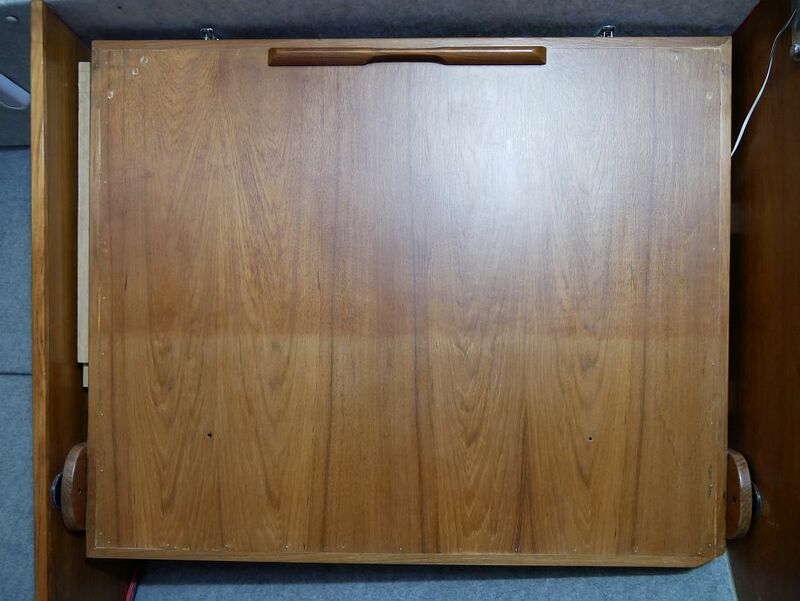 Two more things worth noting about the chart table before I forget are that 1. 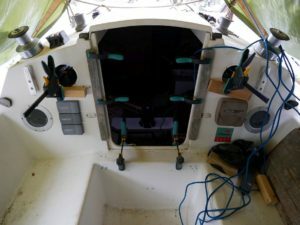 I’ve fitted my final choice of catches (toggle latches from China as the most attractive and size-appropriate option turned up by hours of Googling), and 2. I can’t remember whether we’d previously noted that the new lower nav. 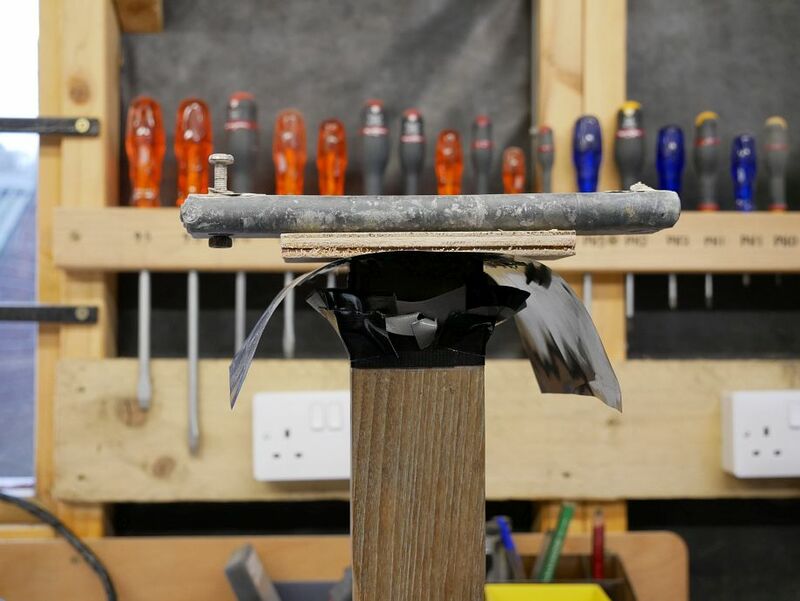 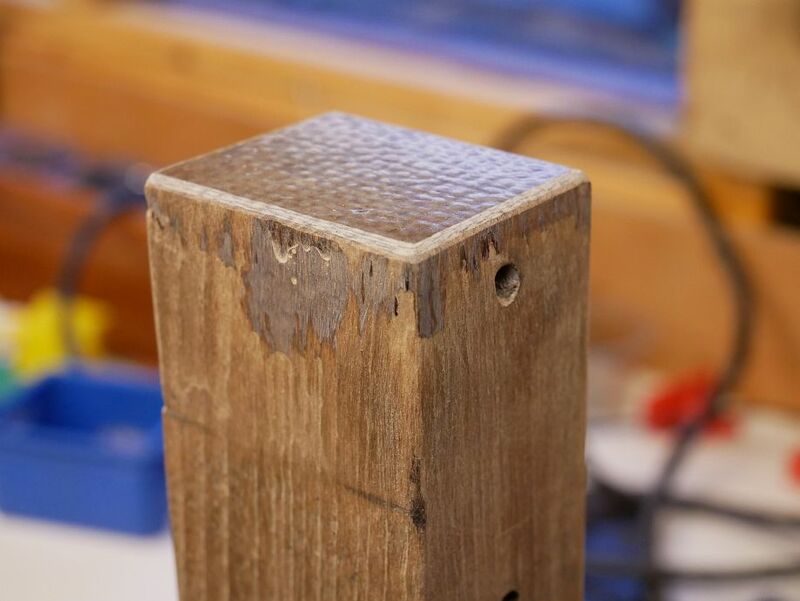 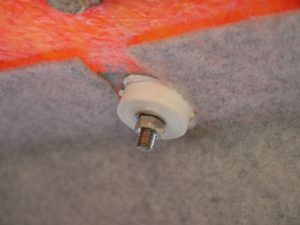 shelf restricts the lid opening angle to c.45°, but it doesn’t really matter because that’s probably far enough anyway and we can get quite a lot more by chamfering the bottom of its edge piece if necessary! 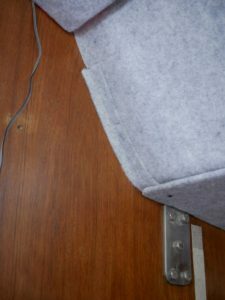 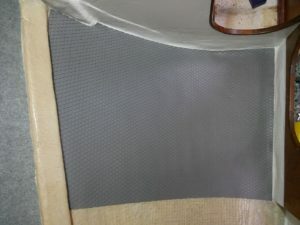 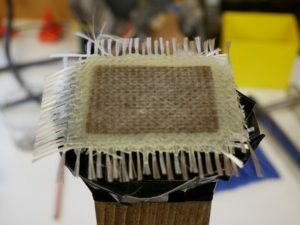 Also happy to note that the new panels are much lighter than the old, with some of the saving coming from slightly thinner ply (3.5mm instead of 4mm), but the bulk of it from the new lining carpet being significantly lighter than the old ‘mousse’. 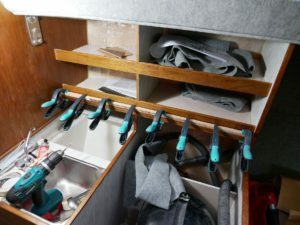 A fortnight ago, worn down by weeks of long phone calls trying to resolve luckless issues with new mobile and broadband contracts, I took the whole weekend off and nothing got done. But Twig was here last Friday (delivering plywood in the snow! 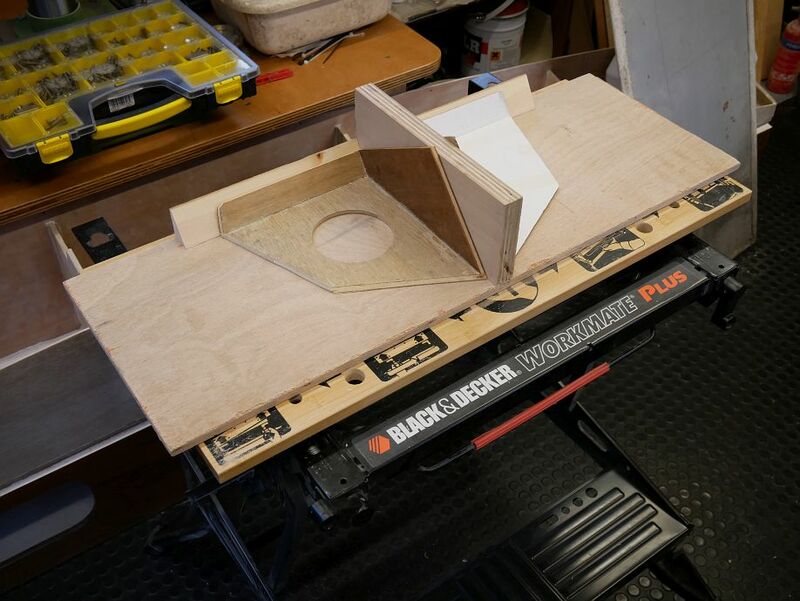 ), Saturday and Sunday as well as Wednesday, and I’ve been working on my own this Friday, Saturday and Sunday to keep making modest progress. 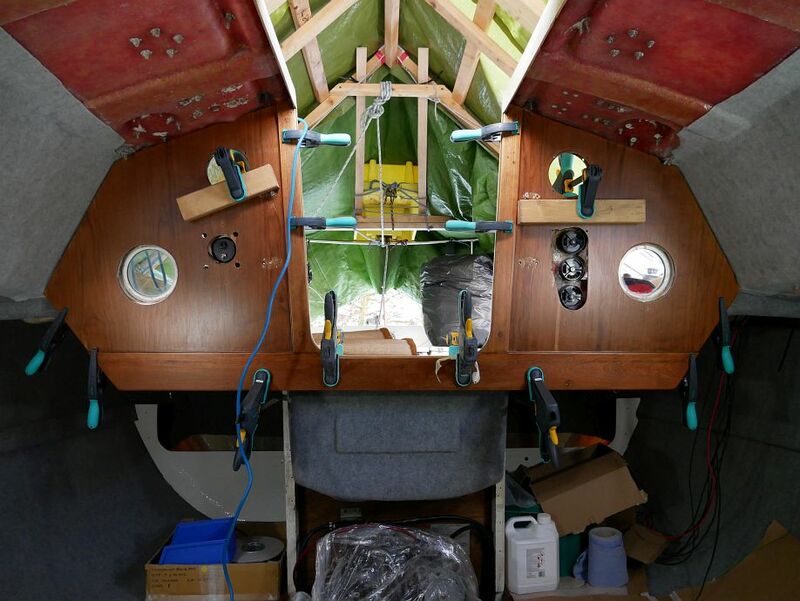 Twig’s got more wiring and stuff fitted as well as the heater pump and water tank vent, and we also got the fuel tank and port steering compass back in while we were both here. 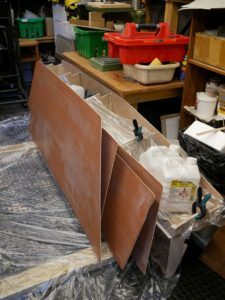 Other small achievements this weekend include more filling and sanding in the heads and forecabin (now ready for Treadmaster pending a little more sanding on Monday or Tuesday evening), shimming the insert on my table saw to get it just where I want it, tidying the workshop yet again, measuring/templating/drawing the shape required for a custom protective strip across the bottom of the companionway, extracting the mains cables from the starboard compass cutout and getting the compass cleaned so we can refit that one too. 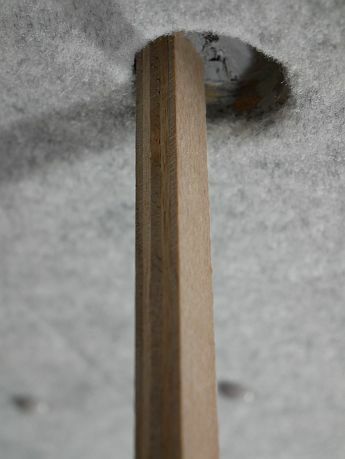 It doesn’t sound a lot, but even ‘little’ things take time and add up. 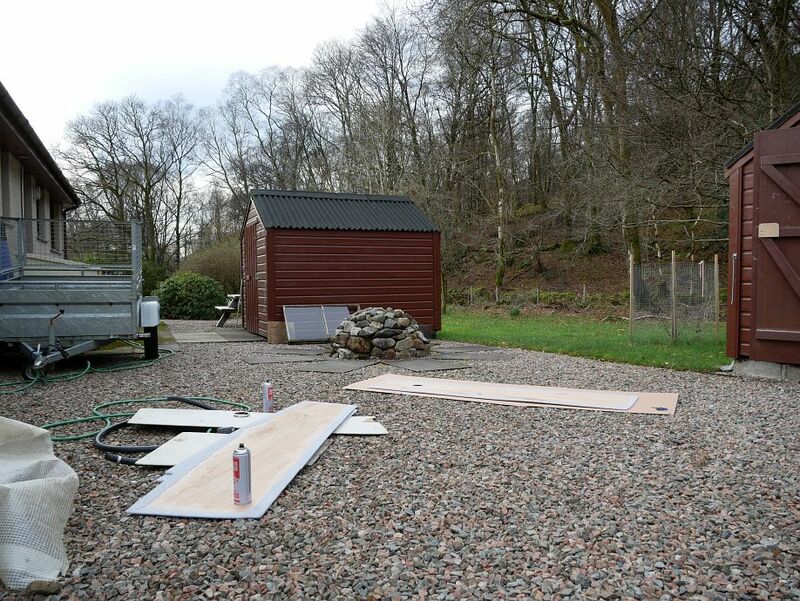 Oh, and it seems any bright, low-angle light (February sun this side of Kinlochleven!) 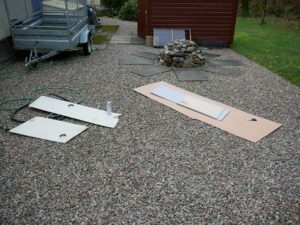 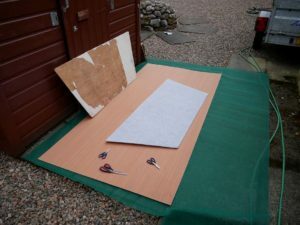 can get through the topsides carpet lining, so it’s not just in snow (which is now away)! And you can see bright light off the snow getting through the topsides carpet (like the deckhead problem we resolved by painting first) to the lower left. 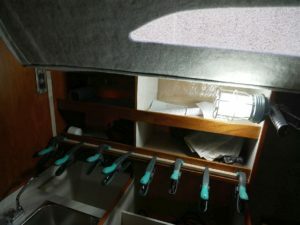 So, while not planning to sail the boat through snow (! 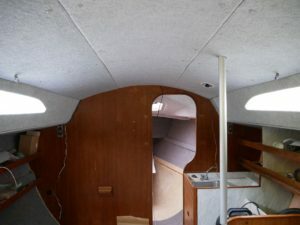 ), I may still have to put up with some of this for summer sailing till I get the (exterior) topsides painted? 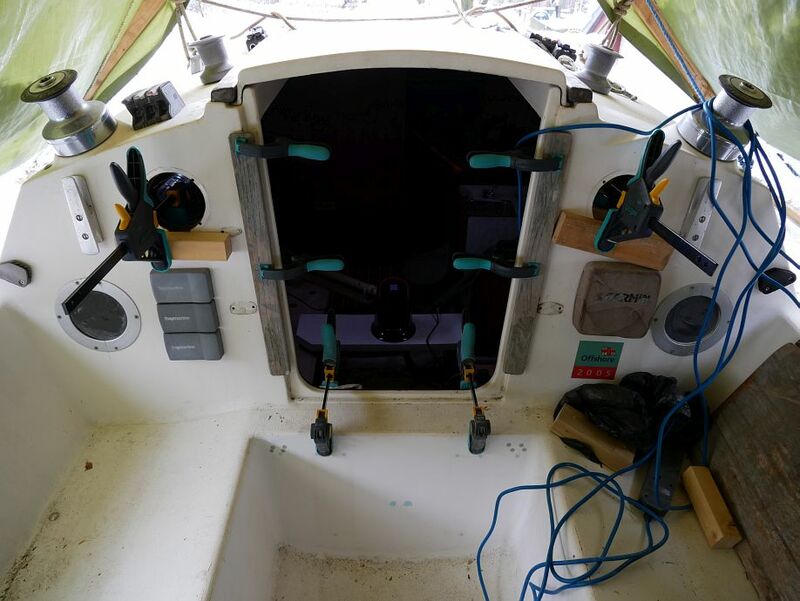 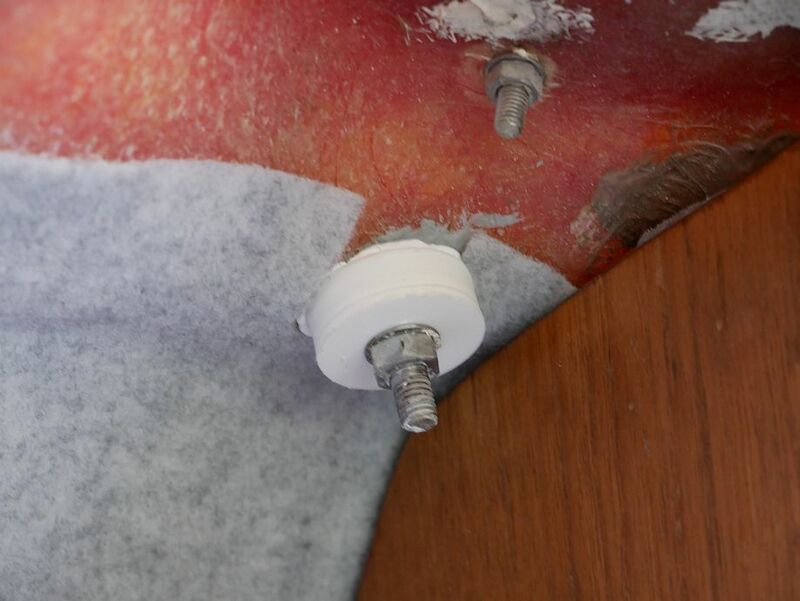 The bulkhead facing looks great in the photos but, despite two machine screws through the grab handle holes to line it up, is now firmly bonded a couple of millimetres below where it used to be. 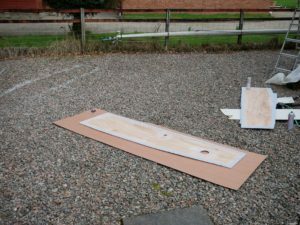 Not the end of the world, but still needing some thought in places. 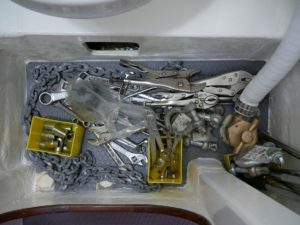 And, for those who’ve seen the cut on my forehead this week, the clamp to the left in the first photo is the one that attacked me when I ducked through the cockpit cover!